Chances are that you would not have heard of Ulm, a mid-size city in Germany. I had not, till a nephew of mine had gone to study in the University there. I had imagined it to be a nondescript small town. When I visited this place, I was pleasantly surprised to find there the tallest church spire in the world, the beautiful Danube (Donau in German)flowing by its side and the most crooked house in the world, schiefes haus, dating back to early 1400 and now restored as a hotel. Ulm is also the birthplace of Albert Einstein. Ulm is an hour and a half away by train from Munich. It lies at the edge of Bavaria, in south west Germany. It is one of the twin cities on either side of the river, with Ulm in Baden-Wurttemberg and Neu-Ulm in Bavaria. Like most German cities, Ulm has a hauptbahnhof – the main train station – which connects to other cities and adjoining countries too like Austria and a good network of trams and buses within the city. The Old Town, with its cobbled streets, the Town Hall and numerous restaurants and cafes with outdoor seating is a charming place and I spent the first evening here. The town hall or Rathaus as it is called in German, is a wonderfully preserved building , covered with bright murals and featuring a 16th century astronomical clock. Strolling in this area, you can take in most of the important places in Ulm – the church (Ulmer Munster), the butcher’s gate, the most crooked house and a walk along Donau. The Ulm Munster is one of the most imposing structures. While the construction began in the 14th century, the current structure was fully completed only in 1890. The top of the steeple,which as of now is the tallest in the world, can be reached by climbing 768 steps. Needless to say, it offers an amazing view of Ulm, the Danube and Neu Ulm across the river. The final stairwell to the top is a narrow spiraling staircase. one has to climb single file here and it is recommended only for those who are really fit. The interiors of the church are awesome. The stained glass windows depicting biblical themes date back to the 14th century. Wolfgang Amadeus Mozart is known to have played the impressive main organ of this church. Though I visited several churches in the following days, in Munich, Vienna, Bratislava, Slovenia, Basel and Amsterdam, I found the Ulm Munster having an unmatched grandeur and spent some time again in this church before leaving Europe. Across the road from the Munsterplatz (the square in front of the Munster), is the quaint marktplatz, the cobbled square encircled by the Town Hall (Rathaus), the pyramid shaped library and restaurants with the fountain known as fish tank at its center. The fountain also dates back to the 15th century and was used by fishermen to keep their catch alive on market days. Leaving the plaza in front of the town hall and walking through the butcher’s gate, you come upon the Danube. The river, as such, is not enticing at first sight. It flows quietly between straight banks and looks more like a wide canal rather than a river. But that could be because I was viewing it with eyes that have seen the rivers in India, the wild tumultuous rivers originating in the upper Himalayas and rushing to meet the plains or the wide rivers coursing through the plains to empty themselves into the sea. But the beauty of the Danube flowing through Ulm is enhanced by the green grass on either side, dotted with trees, which at the time of my visit had the russet hues of autumn and there are benches and cycling/walking tracks all along. It was an autumn morning and in the long walk I had along the river, I came across old couples taking a stroll, mothers pushing the prams with their babies covered in warm clothes, sprinters, joggers and cyclists. There were also ramblers like me, stopping now and then to watch the ducks or sit on a bench for a while. Occasionally, a rowing boat would smoothly, silently and swiftly glide along the river, the arm and leg movements of the rowers well synchronized. And of course the fall colors of the trees are a sight to behold, with the hues ranging from russet to golden yellow to flaming red. If you are in Ulm, keep some time for a long walk along the Donau. Fishermen’s quarter is a scenic part of old town, with half timbered houses and flower pots on the window sills. Blau river, flows through this part of the town into Danube. The most crooked house in the world, Schiefes haus, is also situated here. It is now converted into a hotel. A visit to Ludwigsfelder Baggersee is also recommended. It has a serene lake with lovely grassland meadows around it, There was not a soul in the autumn afternoon that we visited but it seems this place is crowded in summer with swimming and other water activities. I spent my last evening in Ulm by visiting the interiors of the Munster again and taking a long walk in the grasslands around Kuhberg fort, from where you get an aerial view of Ulm and of course, the Munster. The river and the Munster are compelling reasons for visiting Ulm. Make it happen during your next visit to Germany. We had a tiger sighting in zone 3 of Ranthambore National Park within the first hour on the first of the four safaris that we had booked. We counted ourselves as lucky and happily clicked photographs as the tigress Arrowhead walked past our canter, unhurried and unmindful of our presence. Arrowhead is one of the daughters of the tigress Krishna, who in turn is a daughter of the legendary tigress of Ranthambhore – Machli. As Arrowhead moved farther and farther away, we watched her contentedly while waiting for the canter to reverse and move on to other parts of the zone. And suddenly, we saw stealth in her gait, trying to find cover behind the broken branches of the dead trees that were strewn around in that area. In an instant, many of us realized that she was stalking and were able to locate the object of her interest. It was a wild boar, sitting alone in the middle of a marshy area, facing the other way and unaware of the predator closing upon him. The atmosphere electrified as we realized that we were about to witness a tiger kill or at least an attempt to kill. The tigress did not waste time and charged. It was too late for the wild boar which started fleeing only at the last moment. The tigress reached the spot in two seconds, overshot and turned back with unimaginable speed and agility and pounced on the boar, holding it down and trying to choke its windpipe. We had a clear view despite the distance as the kill was made in an open area and we could see the boar struggling and the tigress also struggling to pin it down. The tigress made no mistake of releasing its hold till all signs of life ended and this took almost ten minutes. It is very difficult to describe what I experienced then. Awe certainly, amazement definitely. Sorry for the boar but great admiration for the tigress. Also a sense of gratitude and humility that we were allowed to witness something which establishes the law of nature. The killing and what transpired subsequently were indeed the rarest of the rare events which one witnesses in Indian jungles. We expected the tigress to carry her prey farther from us into the thick jungle on the other side. While the kill was witnessed by people in our canter and in two more jeeps, almost all the jeeps and canters that were in that zone congregated in that area as word must have spread around by then that there has not only been a tiger sighting but that there has been a tiger kill. The tigress got up, surveyed the area around her, picked up the lifeless boar and, to our amazement, started walking towards us. She clearly wanted to go back from where she had sauntered in, on the other side of where we were. The boar was heavy and the tigress Arrowhead was tired after the exertion of the kill. Every time, she could walk barely a few steps before she had to put the boar down, picking it up again after a while. At one point , she stumbled a little and at another, she took a short leap to clear some hurdle in her way. All the while, she kept coming closer and closer, but changed her direction several times which made the jeeps and canters to regroup to provide her sufficient gap for the cross over. We had the closest view when she put the boar down again at the side of the track, between a jeep and a canter. She picked it up again and made a dash across, tail up in the air in panic. By then, all that we wanted was for her to cross the line of jeeps and reach her chosen space and feed on her kill in privacy. Soon she was out of sight and we returned a subdued lot as what we had witnessed had impacted our senses in a strange way. 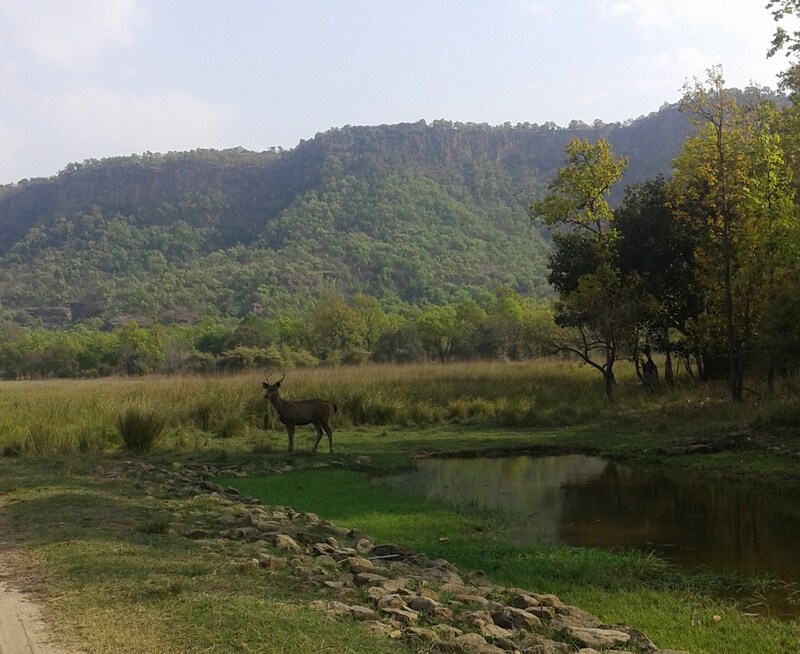 There are several national parks that can be visited over the weekend from Delhi but Ranthambhore National Park in Rajasthan should be on the top of your list. It is an overnight train journey to Sawai Madhopur, which is on the New Delhi – Mumbai rail route and is the town adjacent to the park. The theme “tiger” is present everywhere in the station(which incidentally is very well maintained and clean) – wall murals and paintings, metallic silhouttes of tiger on the station name board and on the facade of the building. There are no forest rest houses inside or even adjacent to the park and all types of accommodation ranging from the luxury hotels to budget hotels to mid range ones are to be found only at Sawai Madhopur. 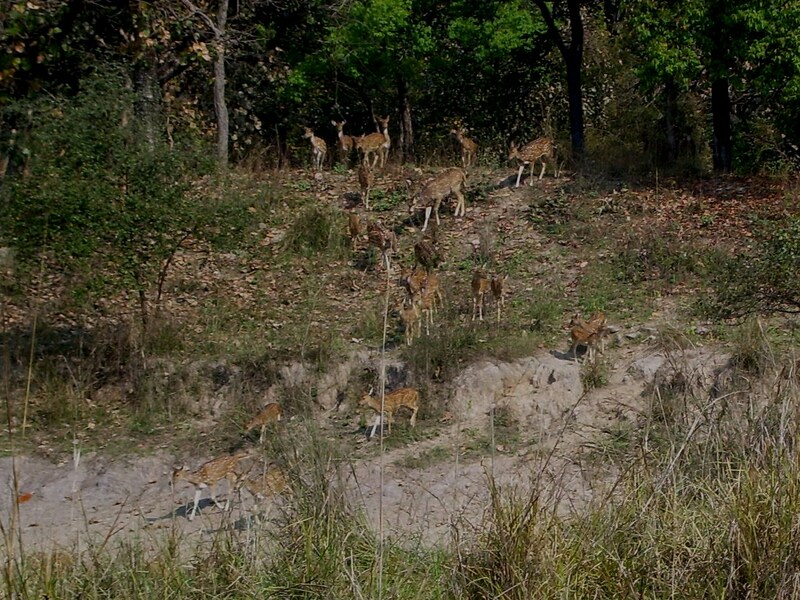 So you can stop thinking about contacts in the forest department for booking a forest lodge, which you may be compelled to do for a visit to Jim Corbett National Park or Bandhavgarh National park or kanha National park. For jeep and canter safaris, booking has to be done online, with photograph and identity proof, not just for Ranthambore but for all the National Parks in Rajasthan. So, you must book your safari first before finalizing the plan to visit this park. The park is divided into 10 zones and a fixed number of jeeps and canters are allowed in the different zones. Zones 1 to 5 are the most popular as chances of tiger sighting are quite high here. Entry and exit of each vehicle is registered and the safari time is adhered to – 6.00 to 9.30 in the morning and 3 to 6.30 in the evening. There is an impressive fort inside the forest with a temple, which is visited regularly by the local population. 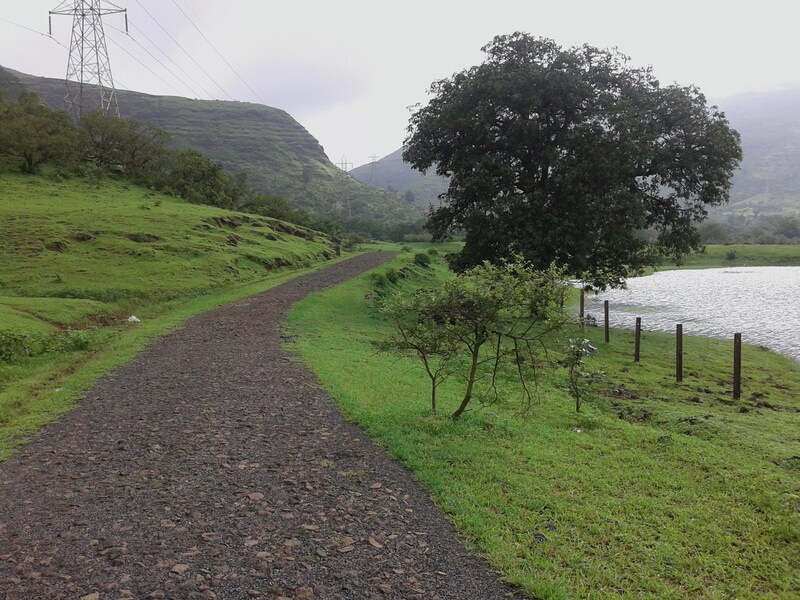 The road from the main gate of the park to the fort is about 3 kilometers and you would come across people on bicycles, bikes and on foot too. 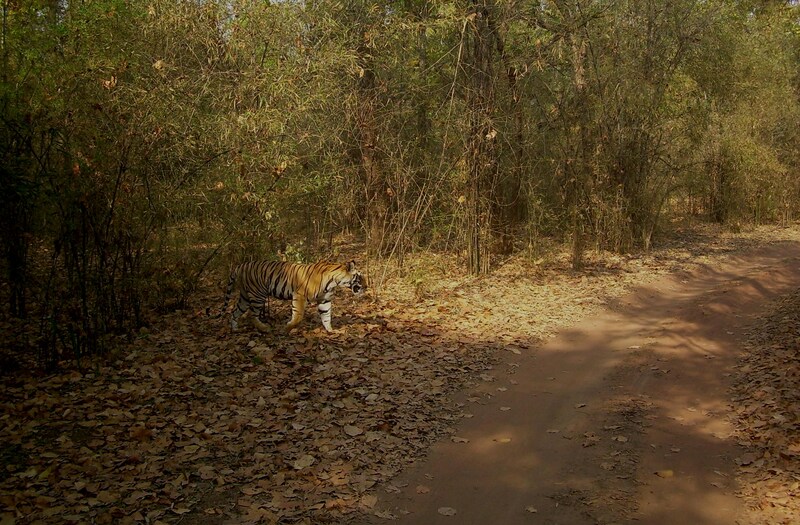 Tigers have been spotted on or near this road, with no untoward incident. 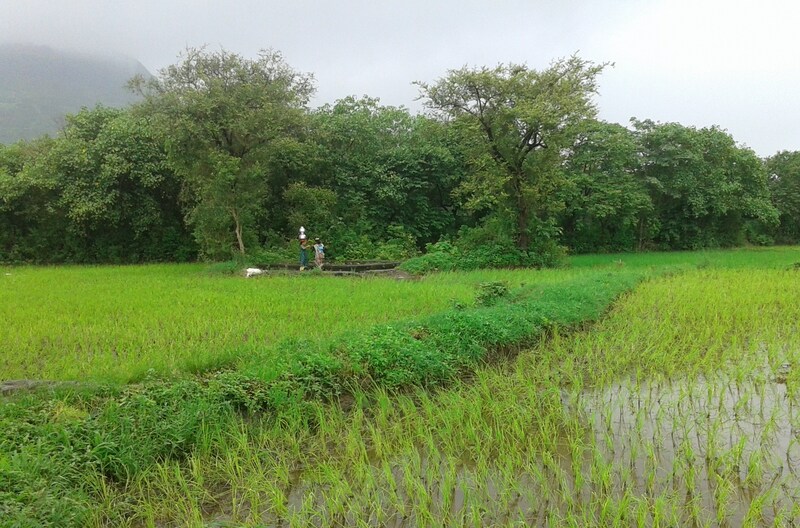 There are several lakes and other water bodies inside the reserve. 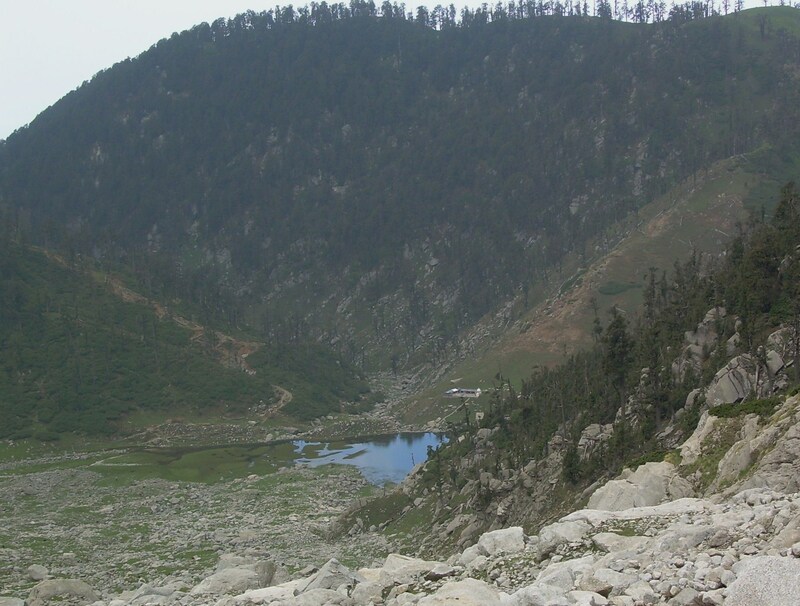 The three famous lakes are Padam talao, Rajbagh talao and Malik talao. All three are beautiful in their own ways. Padam talao is the largest and Jogi Mahal is located at its edge. Jogi mahal has seen better times. Originally a hunting lodge for the royals, it was converted into a forest rest house. 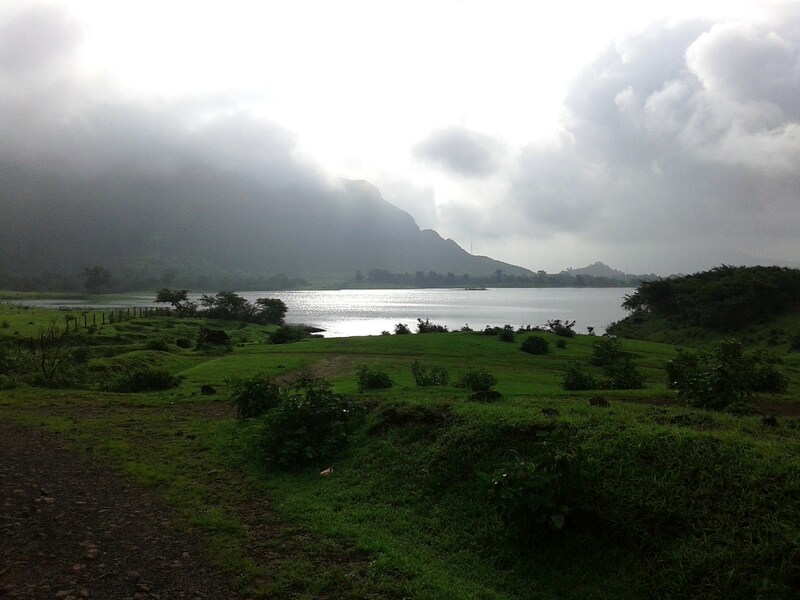 A stay at Jogi mahal overlooking the lake Padam talao teeming with wildlife and birds must have been awesome. Sadly, it is closed to the public now and seems to be in a sorry state of disrepair. Soon, it would be nothing but a ruin, devoured by the jungle. 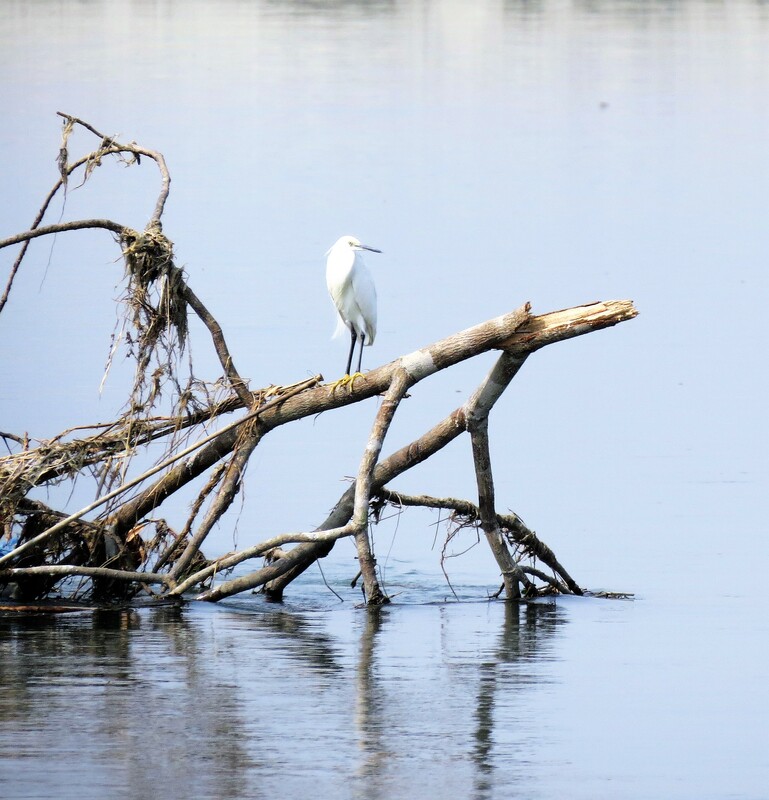 One can spot wild boars, sambhar deer, spotted deer(chital), crocodiles and a wide variety of birds in and around these lakes. I end this piece with snapshots of the sisters Arrowhead and Lightning and the tigress Noor in different moods, captured during the other safaris. Skipping the standard Northeast tourist circuits of Guwahati-Kaziranga-Shillong and Tawang-Bomdilla, we landed at Dibrugarh airport one fine afternoon with a rough plan to explore regions in Upper Assam and parts of Arunachal Pradesh around it. Apart from Dibrugarh and Tinsukia, which are major cities of upper Assam, I had not heard of most of the places in that region till Google opened the windows (is it a pun?) to the information available on the web, some in great detail and some very sketchy. Roing, Tezu, Dehing river, Dibang valley, Digboi (ah! 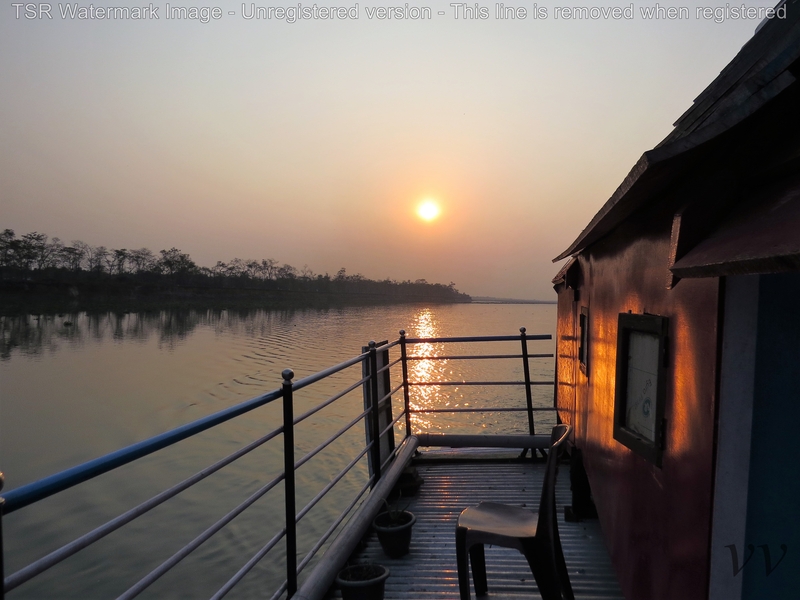 I know that place), Dibru river, Margherita, Lohit river, Patkai rainforest, Maguribeel, Dibru Saikhowa national park, Myudia, Mehao, Miao…….Phew! There is so much to see in upper Assam and the experiences are so varied that you cannot put them all together in a single article. So, what comes in Part I? 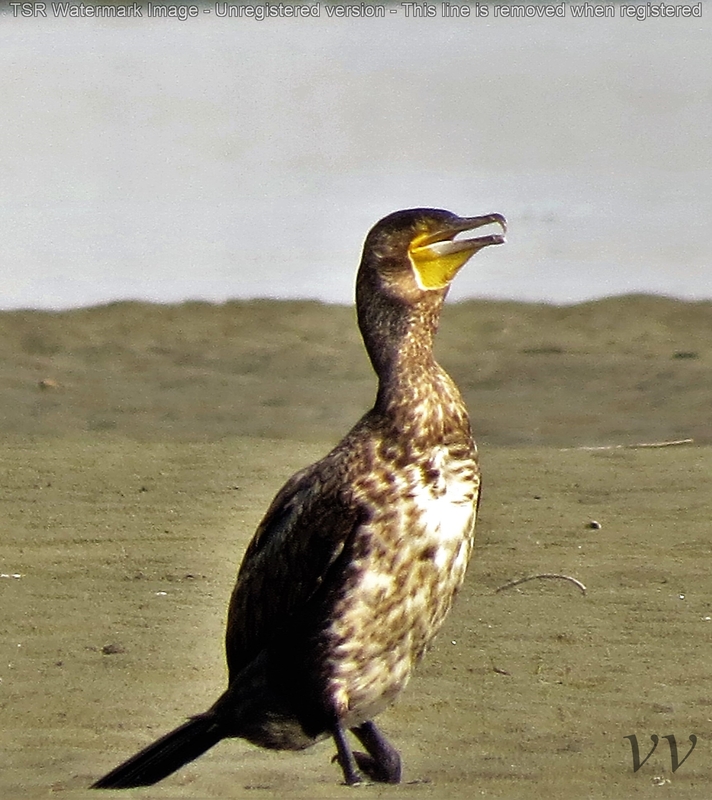 The one which had the greatest impact on my senses – the birds of Dibru Saikhowa National Park and Maguribeel. 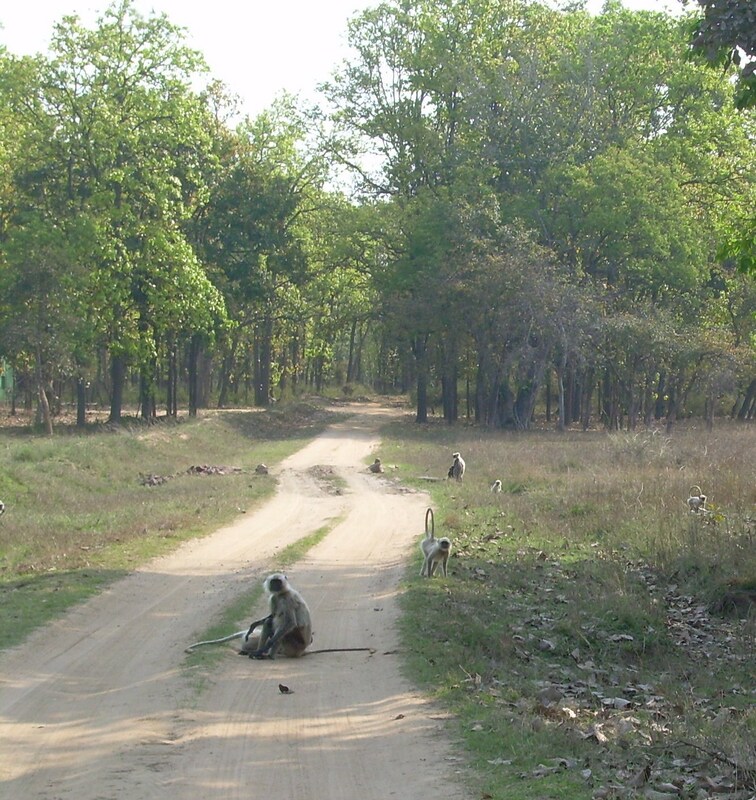 Dibru Saikhowa is a national park as well as a biosphere reserve. In fact, it is one of the identified biodiversity hotspots, that is, a region with a significant reservoir of biodiversity and at the same time, is threatened with destruction, having lost a significant portion of its original habitat. 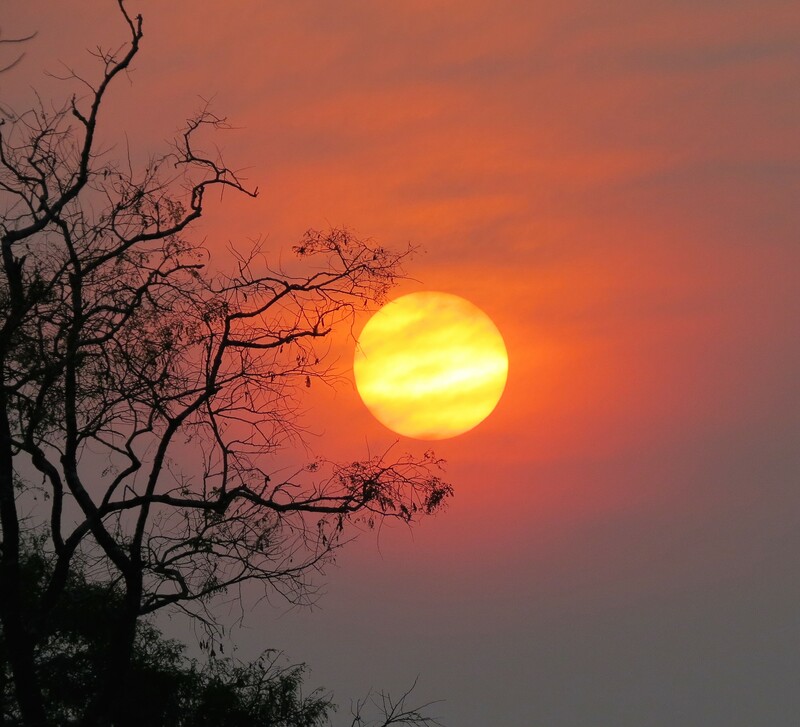 Dibru Saikhowa is unlike the other National Parks of India – you don’t have jeep or elephant safaris, forest lodges and not even beaten tracks. Dibru Saikhowa has two villages situated deep inside the forest – Dhadia and Laika. 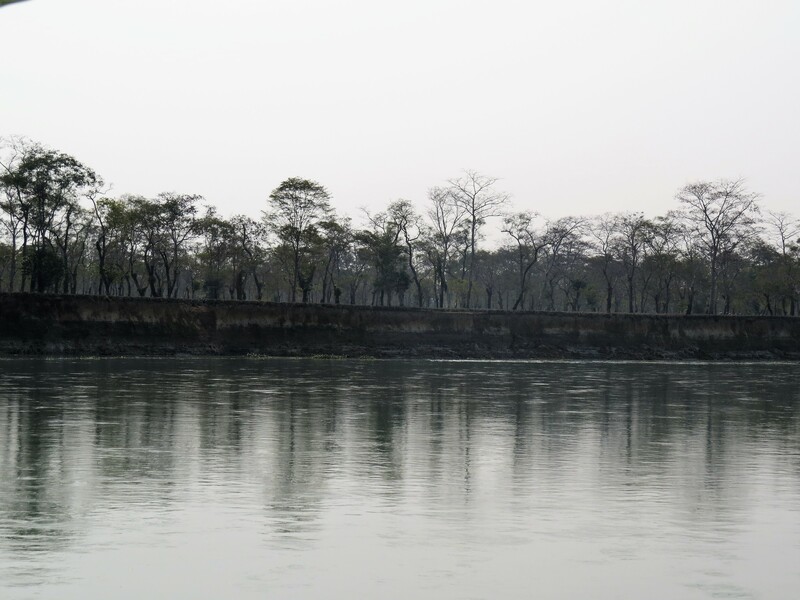 For tourists in general, the park is explored only from the boats cruising on Dibru river, a channel of the mighty Brahmaputra. You reach Guijan, about 12 km away from Tinsukia, from where the cruises start. Om boat house is a well-known cruise operator, a day long cruise costing Rupees 1250 per person, including breakfast, lunch and snacks on board. 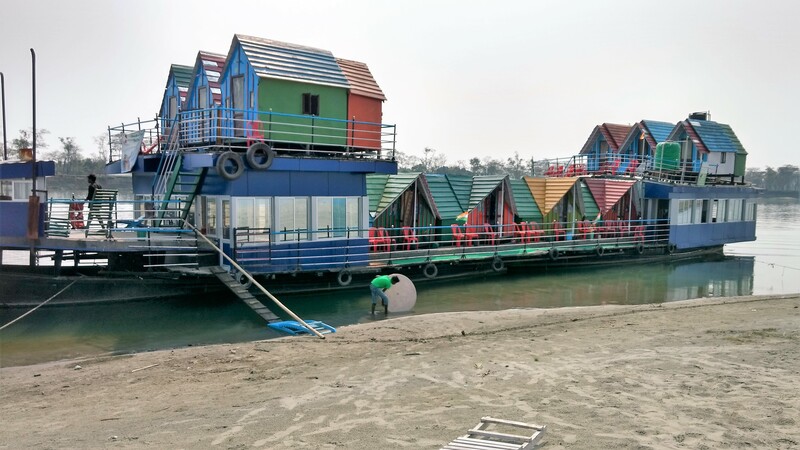 The cruise vessel seems to have been taken straight out of a fairy tale book, with colorful tiny cabins and deck chairs. You cruise over the Dibru for a while, looking out for the occasional dolphin or an egret perched over a drifting branch. After a while, the boat docks on a sandy stretch of the saikhowa forest, deck chairs and sun umbrellas are offloaded and arranged on the shore and the tourists gingerly disembark and lounge around, make themselves comfortable, taking in the scenery and the refreshments. If there is anything overtly touristy about this whole trip, this is it. They could have arranged for at least a short hike in the forest, with permission from the forest authorities, to get a feel of the flora and perhaps get a glimpse of the wild feral horses for which this is a natural habitat. However, after relishing the tourist trappings, we cruised further along narrower channels in a smaller motor boat, and we could see many more birds. Cormorants and ruddy shelducks are in plenty. The latter, also known as Brahmini ducks, swim, waddle and fly in pairs. During the breeding season, the male is distinguished by a black ring on its neck. 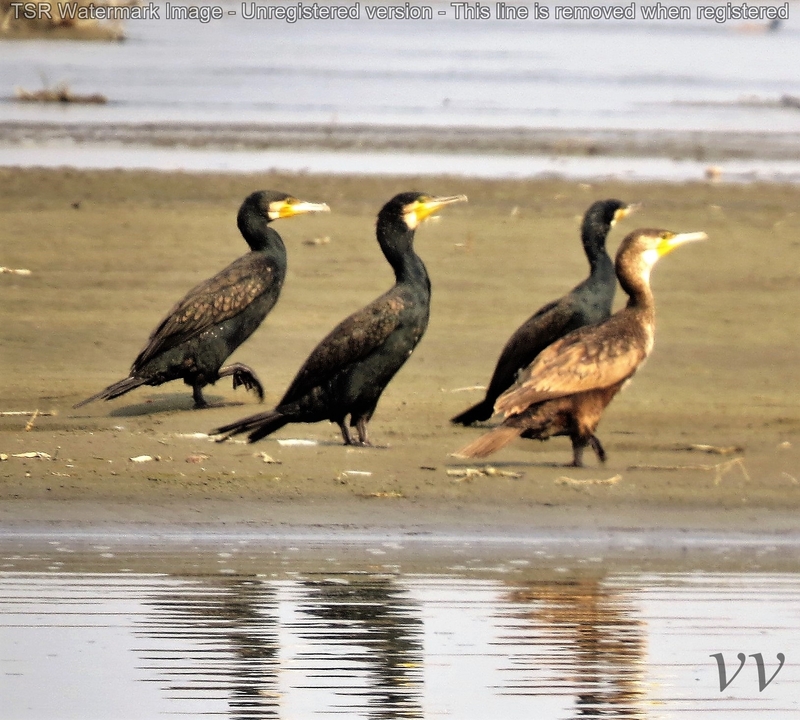 The great cormorants and darters (also known as snake bird) are commonly sighted in dibru saikhowa. After about two hours, the motorboat heads back to where the cruise boat is docked and it is time for lunch on board. It is siesta time thereafter and the cruise ends at guijan just when the sun sets. It was a spectacular sight and we just gazed at the setting sun, the golden hues it spread on the river and at the blazing sky. 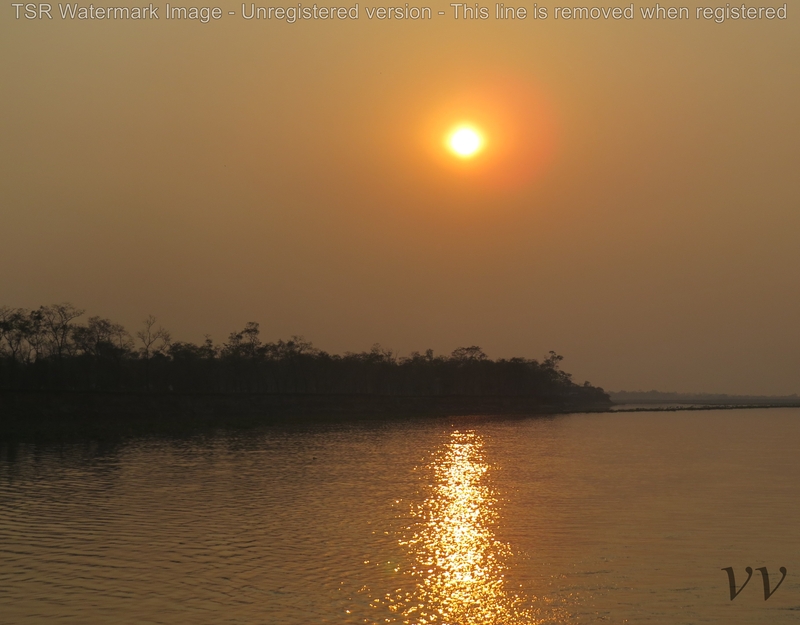 The sunset on the Brahmaputra is one of the most soothing sights that I have experienced. All through the cruise on dibru, we kept hearing about Maguribeel and the excellent bird sightings that a canoe trip can provide. Beel in assamese means lake with marshy areas. Maguribeel is on the south bank of Dibru river and is connected to it by a system of channels. This place has to be visited early in the morning to see hundreds of local and migrant birds. It is a kilometer or so further ahead of Guijan and if you are based in Tinsukia, it would take just half an hour to reach Maguribeel. It is a shallow lake with a thick network of weeds forming the bed and the canoe moves noiselessly through the lake, skirting the marshes which throng with bird life. The white wagtail, a common winter visitor to Assam, is spotted easily but very difficult to photograph as it keeps flitting. I was eventually able to photograph it on the shore after getting off the canoe. 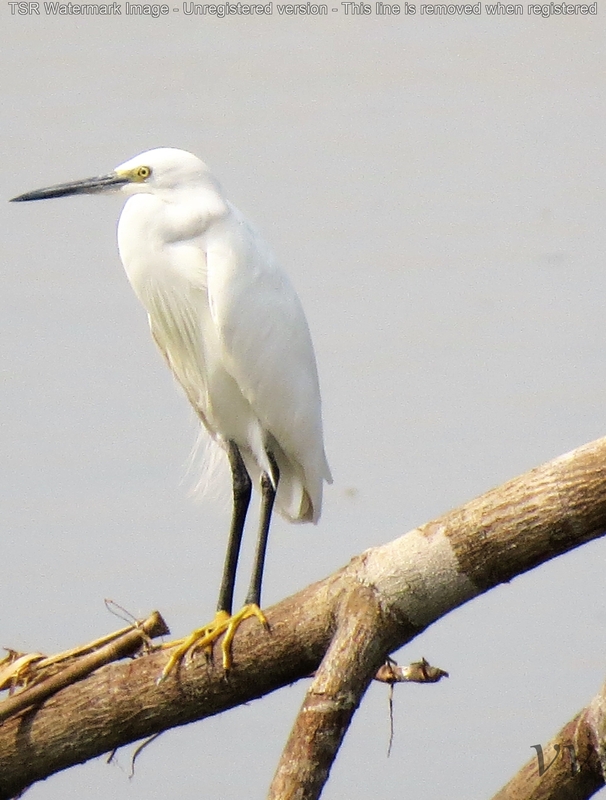 You see a wide variety of birds on maguribeel – purple moorhens, teals, yellow wagtail, open billed storks, black winged stilt, pied kingfisher, night heron and many more which we could not identify. 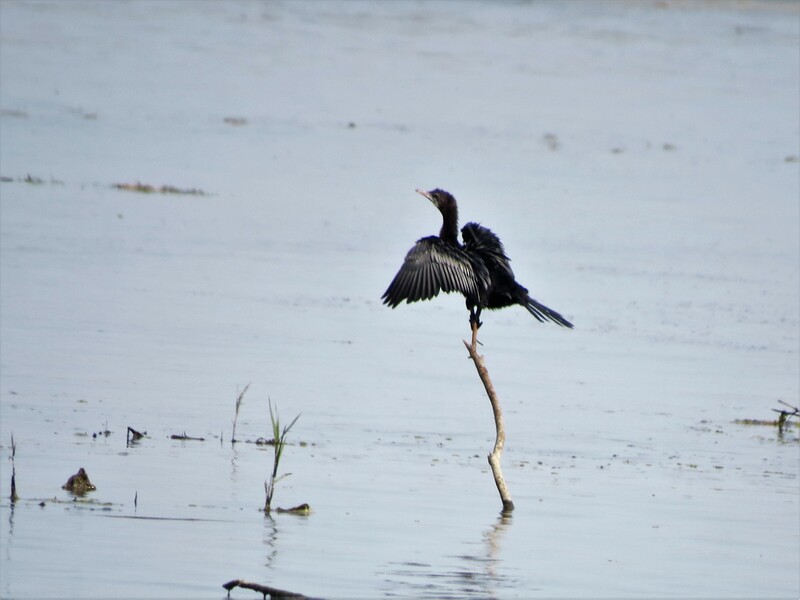 I was truly satiated with an hour spent on Maguribeel but for avid birdwatchers who would like to make several trips on the beel watching and studying the birds, there is a Kohuwan Eco camp with lodging facilities which arranges for boat trips too. I present these black and white beauties as a finale to the memorable time spent at dibru shikhowa and maguribeel. When we decided to make a trip to Kurseong and Makaibari, reactions were predictable. Many had not heard of these places, some thought it must be an inaccessible place somewhere in a remote corner of the north eastern part of India and the ones who knew its location, presumed that we would be halting there for a day before moving to Darjeeling for a full-fledged vacation. But, try Kurseong as a holiday destination and you would be pleasantly surprised by what it can offer. Kurseong is a quaint hill town, perched roughly midway between Darjeeling and Siliguri. This is one of those way-side places that you pass through on your journeys but rarely remember its name, much less choose it as a destination. You can reach Kurseong by road or by rail, both running together for most of the stretch, with the narrow gauge railway line criss-crossing the road at every bend. But if you take the train, be prepared for a slow journey – almost double the time. Darjeeling Himalayan Railways, started in 1881 and still fully operational with most of its original features intact, has been conferred a World Heritage status by UNESCO and has several unique engineering marvels – the Batasia loop, the Z elevations at a few stretches etc. Kurseong would look picturesque from across the hills, but certainly not so if you are standing on the main road near the Railway Station and the market place. Take a look. But, move away from here onto the upper lanes through churches and houses with pretty laced curtains on the windows and flowers blooming in tin pots on window sills or onto the roads leading to the tea gardens, the hill town and the valleys engulfed by mist and you will feel very differently about this place. The obvious place to visit, while at Kurseong, is the Makaibari tea estate. The long leafed Darjeeling tea is known to tea lovers all over the world for its distinctive flavour and you can see how it is grown in Makaibari tea gardens and processed in their factory, which was set up in 1859. Unlike other tea gardens of Darjeeling which have been taken over by multinationals, Makaibari is still with the same family for four generations now. Also, Makaibari tea estate was the first one in the region to adopt organic tea growing and has been a trend-setter. At Makaibari, great emphasis is laid on the plucking standards – smallest shoots comprising two leaves and a bud are plucked by hand and women are preferred for the greater dexterity they have. It is hard work indeed, as 22000 such shoots have to be plucked to get a kilogram of tea. Plucking starts early in the morning before the overnight dew evaporates. At the factory, the plucked tea leaves go through the process of withering, rolling, fermentation and drying. The green leaves are evenly spread on huge troughs, through which hot and cold air is blown in a regulated manner so that moisture is removed slowly in about 15 hours. The withered leaves then go through a roller machine which twists and twirls the leaves gently without breaking them. The rolled leaves are then spread in a thin layer in a cool and humid room for 3-4 hours to allow fermentation. The fermented leaves then go through a dryer with regulated temperature. Almost all the machines at the Makaibari tea factory have the “Brittannia” marking: These had come from England a century ago and are fully functional even now. The tea leaves then go through the final steps of sorting, grading and packing. Makaibari produces the world’s most expensive tea, “silver tips” – which is plucked under a full moon. Visitors are taken around the factory and the process of making Darjeeling tea is explained. There is also a museum which traces the history of the Makaibari tea gardens and displays the milestones achieved over the years and other testimonials. While at Kurseong, take time to visit the churches and the Darjeeling Himalayan Railway museum, watch the train move through the crowded market place with the people going about their business just two feet away from the track and taste the excellent momos at West Bengal Tourist Lodge. Also, skip Darjeeling if you want the magic of kurseong and Makaibari to linger. What is it that makes me go back, again and again, for a hike in the Himalayas, I wonder often. 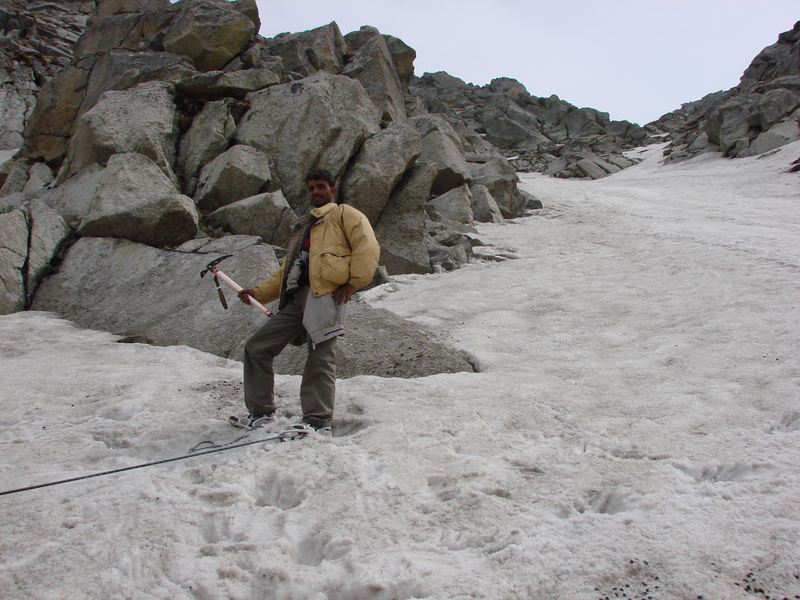 I lack stamina, have not been into any form of sport my entire life, cannot really call myself adventurous, I get easily scared when the weather turns foul at higher altitudes in the mountains and crossing a glacier gives me the jitters. In short, I am a very unlikely candidate to keep up with this activity for so many years. And yet, I have gone for trek after trek, year after year, well into my forties and fifties. I am sure the credit goes to the Himalayas for stoking and keeping this passion alive in me. The bottom line is – If I could do it, you can do it too! People like you and me who are not adventure freaks or into serious mountaineering but who would like physical exertion, breathe in the fresh mountain air and be one with nature can hike on the innumerable trails in the Himalayas. At the lower altitudes, these trails take you through villages, meadows, forests and streams and as you ascend, the tree line recedes giving way to glaciers and snow laden mountains, Himalaya meaning the abode of snow. 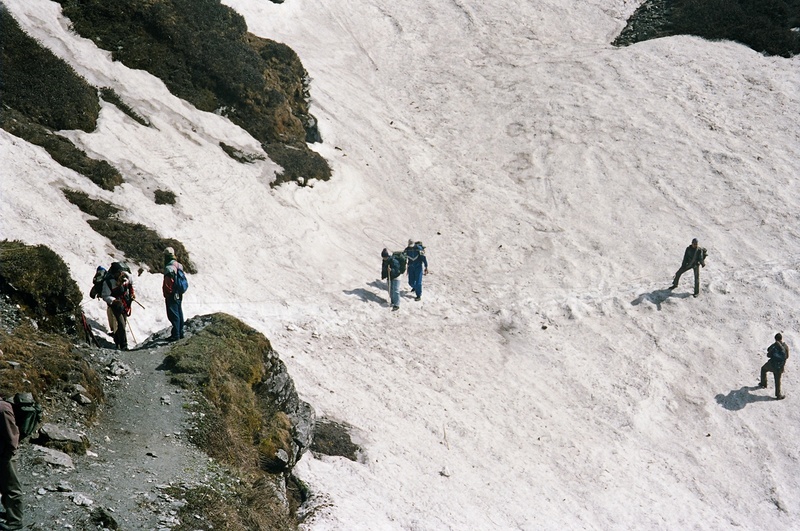 So, here are a few tips for the uninitiated on how to go about a hike in the Himalayas. Just do it and let the magic unfold. 1. 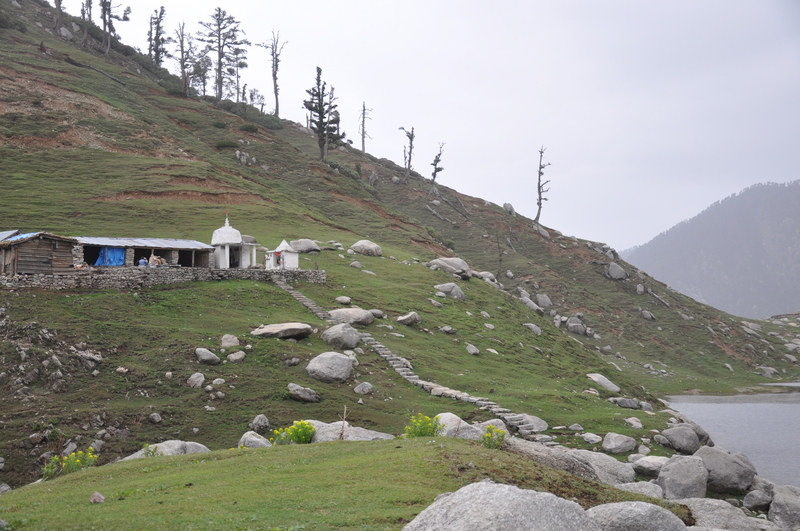 As a first trek, choose a simple one of not more than 2 or 3 days and not taking you above 8000 to 9000 feet. There are several good treks at lower altitudes like Mcleodganj- Triund near Dharamsala, Nag Tibba near Mussorrie, Deoriataal and Tungnath-Chandrashila near chopta, Parashar lake near Mandi, valley of flowers in Uttarakhand, Dayara Bugyal near Uttarkashi, Sandakphu near Darjeeling, Beas Kund near Manali etc. 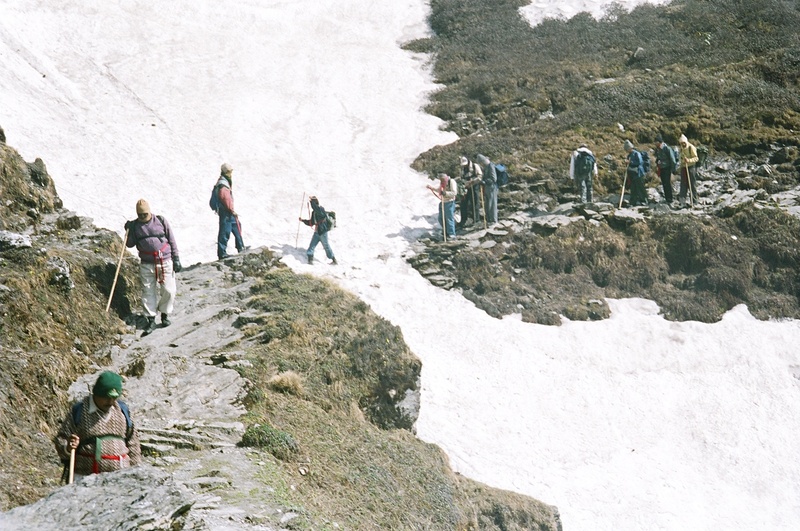 Don’t dream of doing the Goecha La trek in Sikkim or the Pin Parvati trek straightaway. The tree line ends at about 11000 feet and conditions generally get harsh beyond this altitude requiring acclimatization. 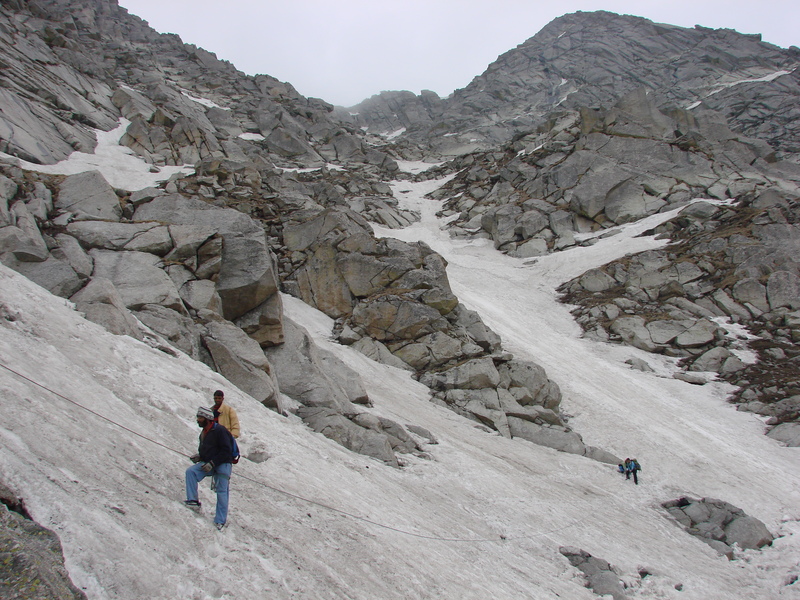 A trek involving crossing of a Pass at 12000 feet or above should be attempted after experiencing a couple of treks to lower altitudes. 2. 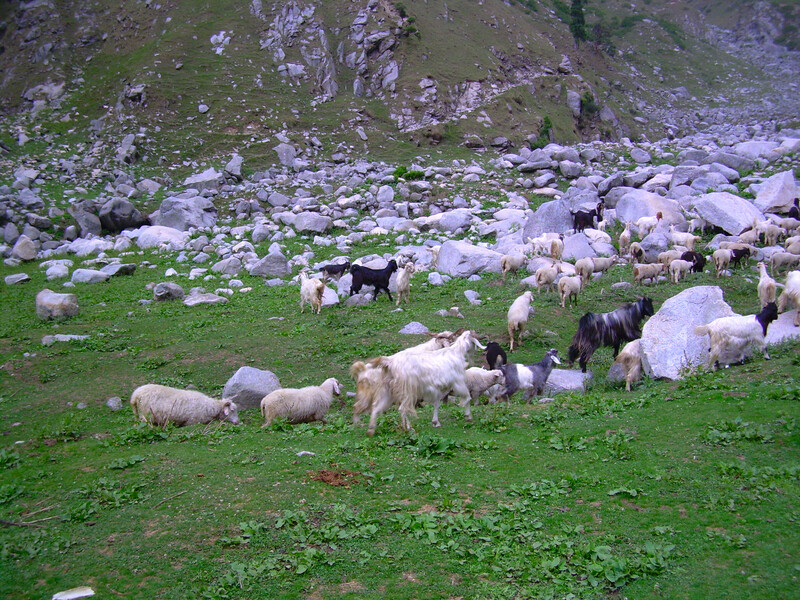 Read about the terrain, the trek route, the level of difficulty, the best time to trek, how to reach the starting point of the trek, the flora and fauna of the region, the villages en route etc. Most of the information is available on the internet. This will make the trek enjoyable and wholesome rather than experiencing it as an adventure activity alone. 3. The next aspect that you need to decide is whether to go with people/organizations well established in this field or you want to go on your own with a group of friends. The benefits of starting with an established group are many. They have a wealth of knowledge and experience which they share with the participants in their orientation sessions, take care of all logistics of arrangements and also provide trekking gear. Some of the prominent ones are The Youth Hostel Association of India (www.yhaiindia.org), STEP Trekkers (www.steptrekkers.org), Indiahikes (www.indiahikes.com), Indian Himalayan Adventures (www.ihaclub.com). A few treks down the line, you can think of doing it on your own, hiring guides, porters, cooks and tents. 4. Do not start buying expensive and top end hiking gear immediately. Yes, a good pair of hiking shoes is a must, which should be used and broken into before the trek. The need to buy other equipment will depend upon the nature of the trek and what can be hired or borrowed easily. You can start buying rucksack, sleeping bag etc after you have done a couple of treks and intend being a regular. 5. Start walking regularly for about 45 minutes to one hour every day, at least for one month before the trek. This really helps. And climb stairs to the extent possible. Otherwise, you will end up with extreme stiffness in the legs on the first day of the trek. Even if you have been walking regularly in the plains, it would still be better to have an acclimatization walk in the hills on the first day and start the trek the next day. 6. Packing your sack sensibly with the essentials with the weight distributed evenly is an art which needs to be perfected over the years. Take minimum number of shirts and trousers but you can be liberal in the number of undergarments and socks. One warm sweater, a jacket with windproof covering, a woolen cap/muffler, thermal gloves, and sunglasses are the essentials. The clothes should be packed in 3 or 4 separate thin waterproof covers to keep them dry even in a heavy downpour. Stack the clothes packets vertically with two packets at each level so that the weight is distributed evenly from the bottom of the sack to the top. The heaviest items should be in the middle portion. Pack the rainsheet, gloves and woolen cap in the top compartment of the sack for quick access. Many sacks come with a separate access to the lowermost compartment, which would be ideal for packing the sleeping bag. The water bottle goes obviously on one of the side pockets for easy access while walking. 7. For protection from rain, a rain sheet is the best and will serve the purpose much better than a raincoat or a waterproof poncho or waterproof trousers and uppers. A rain sheet (called a barsati in Hindi) is just a large waterproof sheet folded and stitched at the top to form a hood over your head and body and is large and loose enough to cover your sack too. You can hold the sheet ends and continue to walk comfortably or it can be made hands free by attaching strings to the sheet which can be loosely tied over the abdominal area. It generally rains in intermittent spells during the day and a rain sheet is the easiest to put on and take off. 8. Do not trek on an empty stomach but at the same time, do not have a very heavy breakfast as it would tire you before you have trekked even a kilometer. Walk at your own pace, steadily without having frequent resting/snacking breaks. Whenever you feel tired or out of breath especially while walking uphill, take very short rests leaning on rocks instead of sitting down. If you sit down frequently, thinking that the rest will energize you, walking will become even more difficult. Take small sips of water whenever you feel thirsty and sucking sugar candies also helps. Munch on snacks like dry fruits or chocolate while walking and ideally you should have two snack/tea breaks and one lunch break in a trek of about 10 kilometres of 6 to 7 hours. During these breaks, you should relax with the sack off your back and take off your shoes too if you like. If you are already at some height, put on your sweater or windcheater as soon as you sit down as the heat generated in the body while walking dissipates immediately. 9. While walking, keep to the mountain side and watch where your next step is going to land. If you want to take photograph or just enjoy the scenery around, stop walking for a minute or two. Doing any of these while walking, can lead to a stumble and a fall, sometimes with very serious consequences. Another safety aspect to be observed is not to overtake another trekker when the path is narrow and certainly not without intimation or in a hurry. An accidental rubbing of the sacks or rolled floor mats on top of the sacks can actually topple over either person. 10. 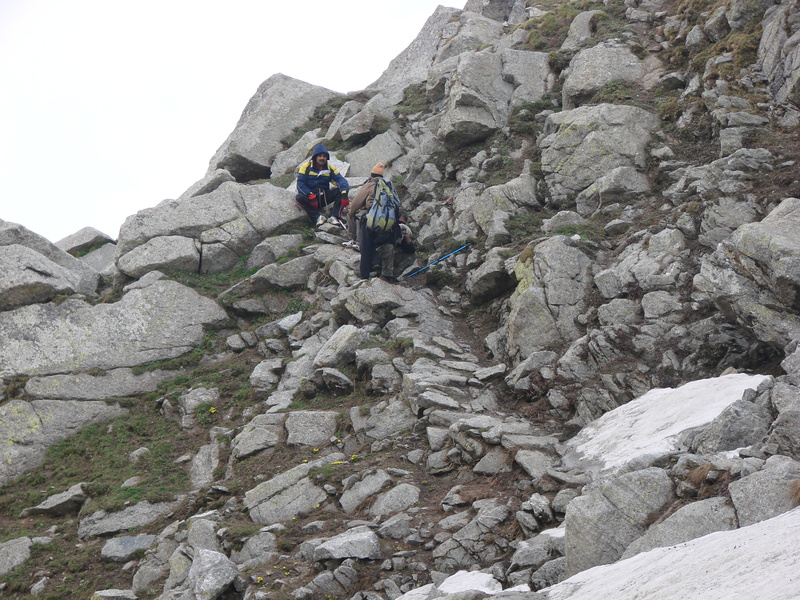 Be aware of Mountain Sickness which can strike anyone as altitude is gained, especially if the ascent is not gradual and the body is unable to acclimatize. Headache, nausea, dizziness and inability to follow instructions are some of the symptoms as oxygen supply to the brain gets diminished. If symptoms persist, it is safest to descend to lower altitudes as Acute Mountain Sickness can be fatal once it sets in. Also, once you have reached some altitude, do not go to sleep at night without eating, irrespective of how tired or exhausted you are after the day’s trek as this can also have serious consequences. 11. 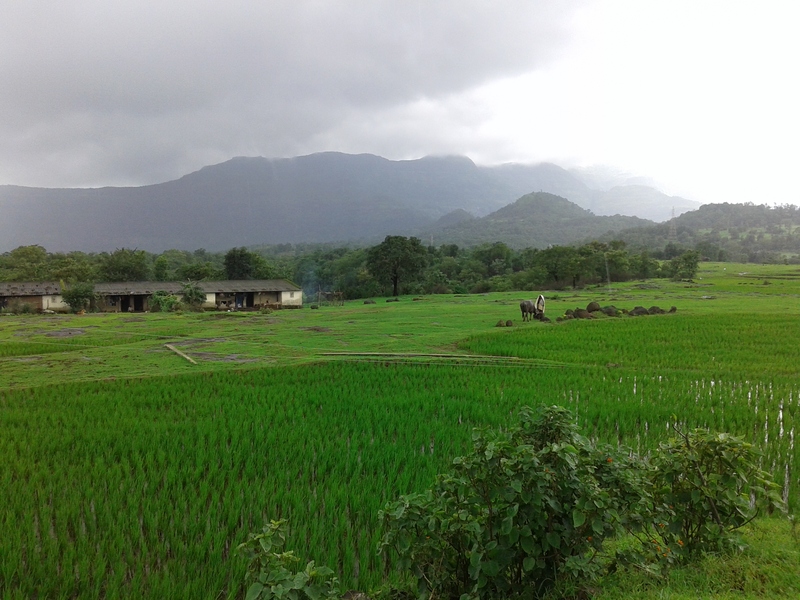 Respect the mountains, the local customs of the villagers and ensure that your hike is environment friendly. Littering is a big NO NO. 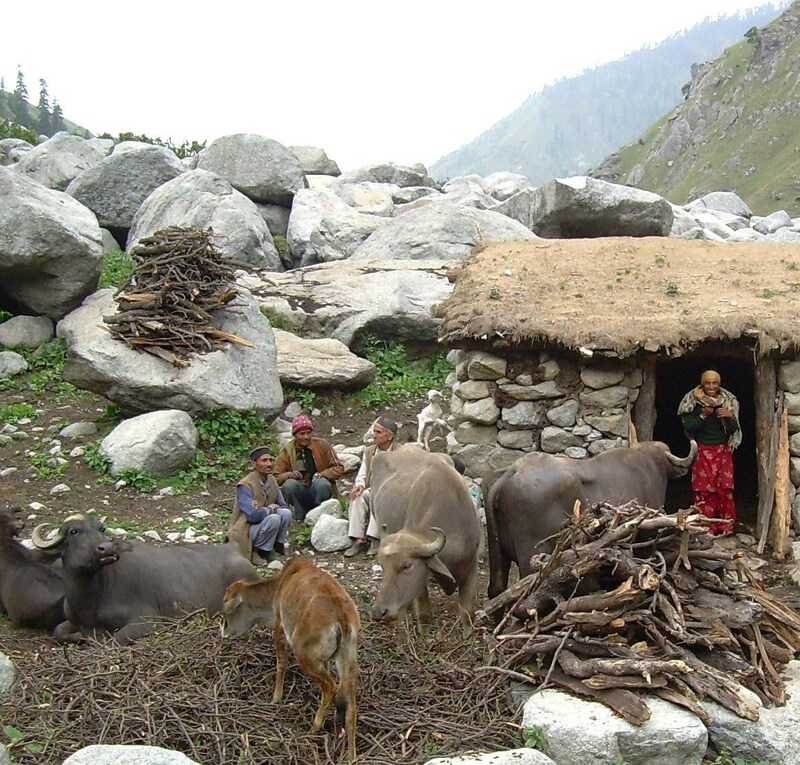 Walk up to the village or shepherd huts near the camp and interact with the folks to get an insight into the life in the mountains. You will be amazed at the friendliness and warmth that you would receive. If you can, carry small gifts for the children that live in remote areas. 12. Once you reach the camping place and the tents have been pitched, keep your sack at the head of the mat assigned for you and take out only the bare minimum items for changing clothes, footwear to be used in the camp etc. 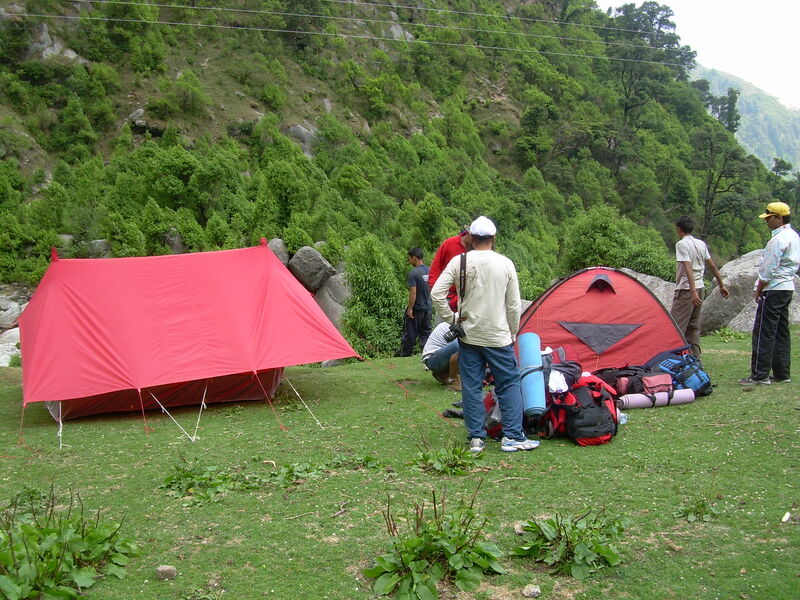 DO NOT unpack your sack completely and fill up the limited space inside the tent. Just imagine what the tent would look like if all the occupants did likewise! If it is a sunny day, you can leave the shoes outside but before you retire for the night, keep the shoes in an orderly fashion between the outer layer and inner layer of the tent to ensure that these do not get wet due to rain or even dew. 13. While there is still some daylight, locate essential items like medicines, torch, water bottle, plate, mug, muffler etc that you may need at night. Rummaging through the sack for any of these in the darkness, with the help of a torchlight can be very difficult and extremely irritating for your companions. Since you will be sharing a very small space with several others, follow basic etiquette like not talking too loudly when others are resting/sleeping, not airing your smelly pair of socks on your sack etc. Of course, if you snore, you cannot do anything about it except sympathize with the other occupants the next morning. 14. The Himalayas abound with wildlife – panthers, black bears and birds – but it is very unlikely that you would encounter them during the day. If you have to go out at night to answer nature’s call, don’t go far from the cluster of tents and take a bright torch and also a friend along if possible. 15. 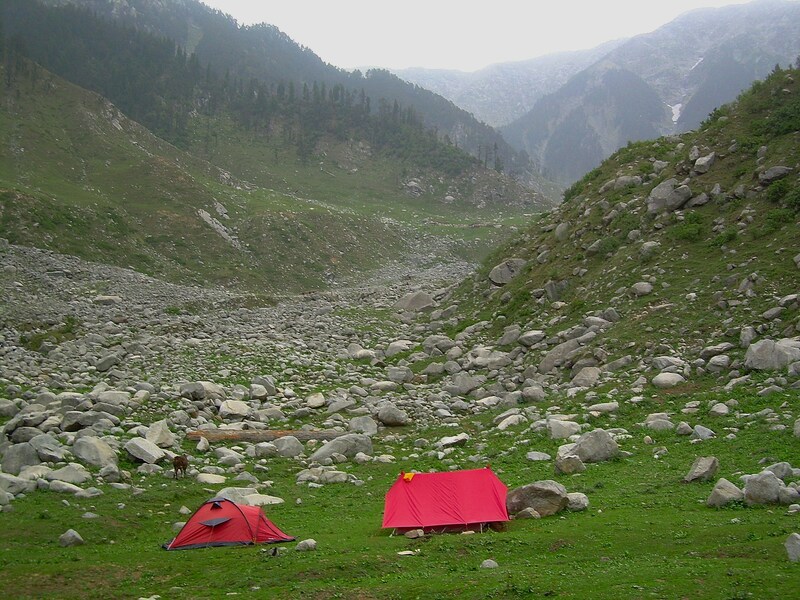 Lastly and most importantly, enjoy the hiking and camping experience. Breathe in the fresh unpolluted air and the heady scent of pine cones, have your dinner under a sky filled with unbelievable number of stars, nestle cozily in a warm sleeping bag inside the tent, get up at the crack of dawn to experience the silence and the wilderness around, huddle around the fire in the make-shift kitchen with a hot cup of tea and chat up with the cook, catch the first or last rays of the sun on the snow peak in front and share stories with fellow hikers during campfire. Experience all of these and more – the laughter and banter among friends, a great appetite, good physical exercise and watch the cares and worries dropping off like withered leaves. I dived into the blog world last year with much trepidation. Will someone ever read what I write? Will I sink without a trace? And what should I write about? It was easy to choose “travel” as the subject as I have travelled quite a lot, mostly within my own country – India – and if not interesting, I would at least be authentic, I thought. Also, I have always enjoyed reading travelogues, which helped me veer myself more in this direction.The kind of travel I have enjoyed the most is hiking in the Himalayas, so I zeroed in on this topic and took the plunge. Writers want readers and I am no exception. Not being very active in the social networking area, my hope for attracting more readers lies in effective usage of the tools available for increasing visibility. I do want to write on other matters too that are close to my heart. And it has always been a dream to write short stories. It is another matter that I have not even made a first lousy draft. But I will, I will, now that I am here and intend sticking around. 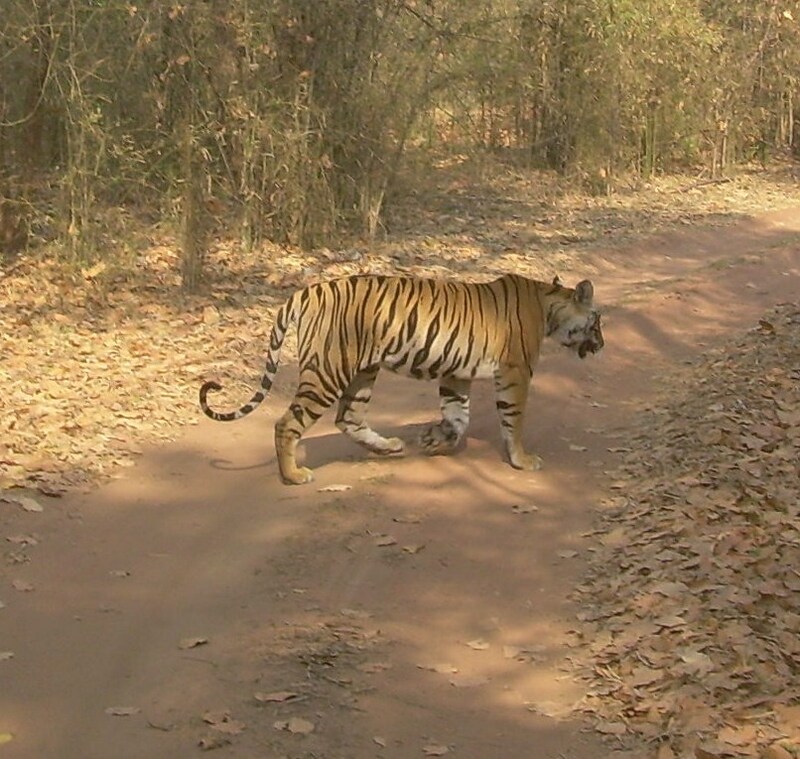 “Tiger Tiger” whispered the guide animatedly, the thrill and excitement in his voice not dimmed even after innumerable tiger sightings he must have had in the last 19 years that he has been in Bandhavgarh. The atmosphere electrified immediately and there was a palpable tension in the air. 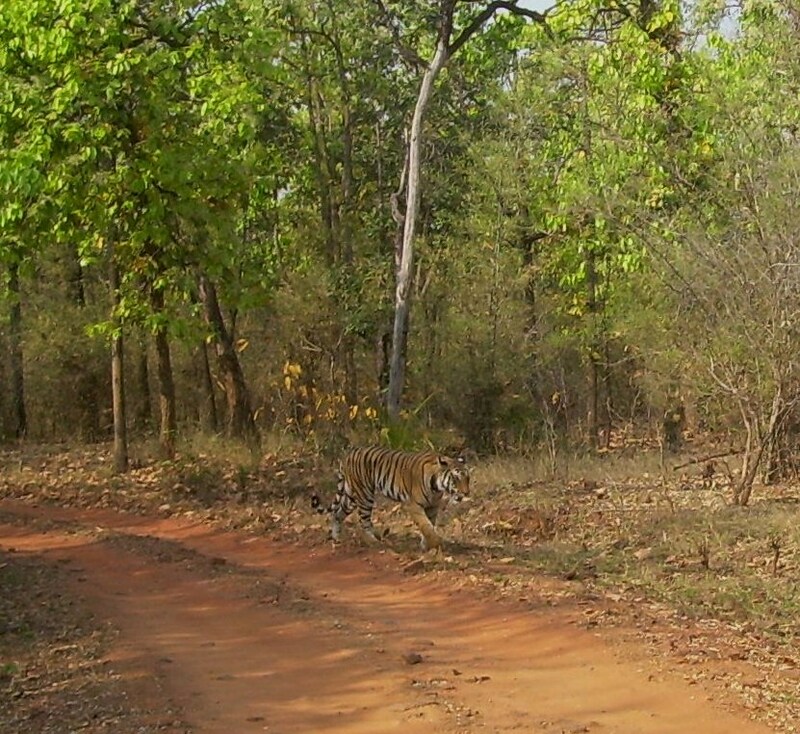 We were in the last leg of our last jeep ride in Khitauli area of Bandhavgarh Tiger Reserve when we spotted the tiger. It was a full grown female cub and she and her sister had not yet left the mother to strike out on their own, informed the guide. 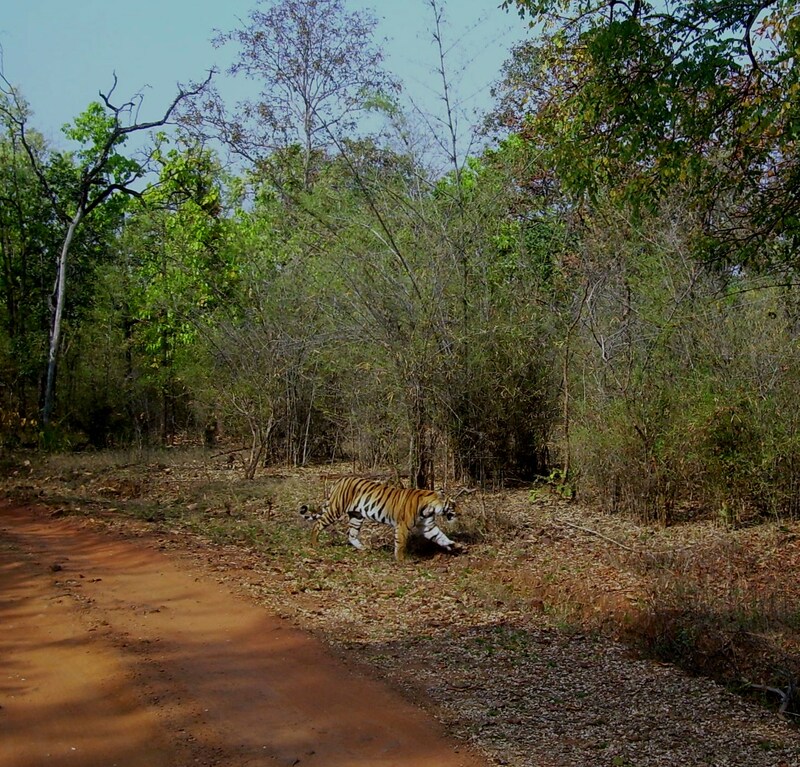 The tiger, beautifully camouflaged in the sal tree forest, kept walking parallel to the dirt track on which our jeep was. The guide knew that it would soon come onto the road and cross it and so we stopped and waited. And soon enough, the tiger emerged from the tree cover, strode majestically across the track with not even a glance bestowed on us. The guide knew where it would exactly emerge again and swiftly we reversed and moved across the criss-cross of tracks and waited at a spot and were rewarded by another sighting of the same tiger. This time, it walked on the track for a while, with our jeep following it slowly at a safe distance, before it entered the forest again. 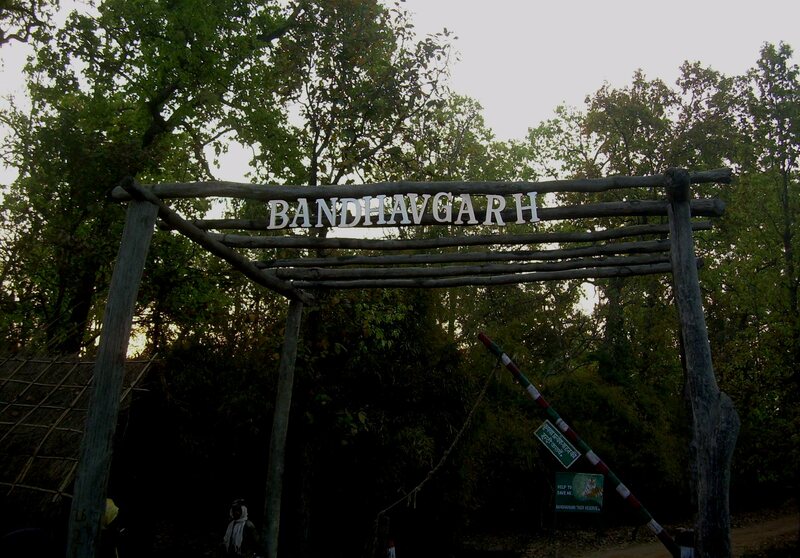 Bandhavgarh Tiger Reserve in Madhya pradesh in central India is typical tiger country immortalized by Kipling and has a very high density of tigers. 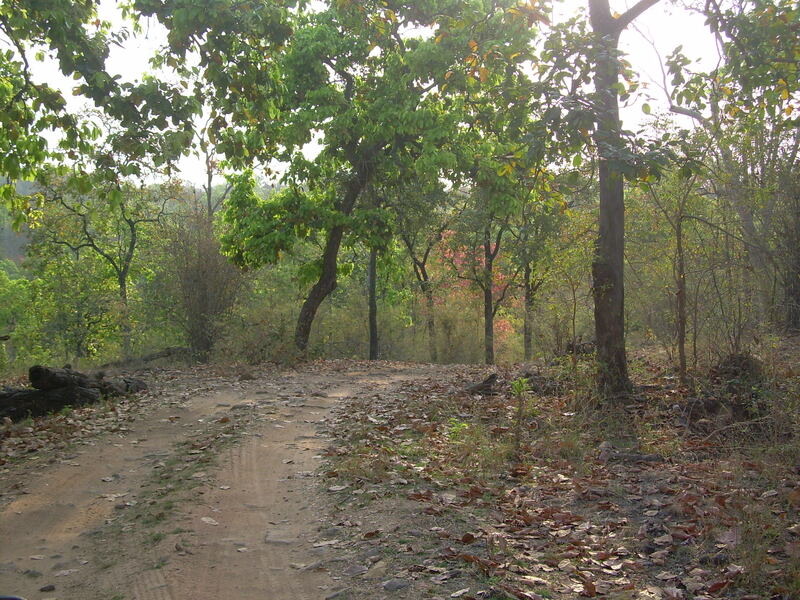 The National Park is divided into 3 zones – Tala zone, magadhi zone and khitauli zone. We had spent 3 hours the previous evening in Tala zone, which is undoubtedly more beautiful than the other zones. 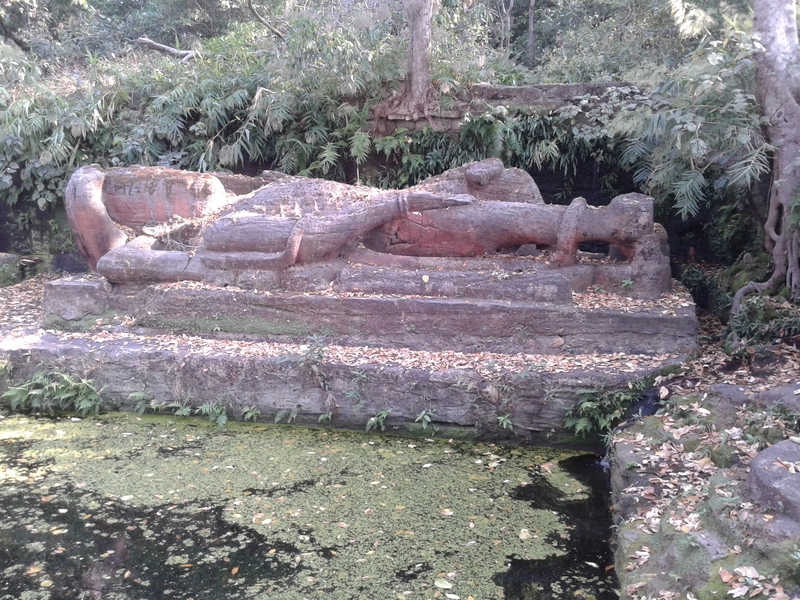 It has open grasslands, view of the Bandhavgarh fort which overlooks the forest, a place called “Sheshashaiya” – a huge idol of Lord Vishnu reclining on the seven hooded serpent Sheshnag with the spring waters emanating from near the feet. This zone is also dotted with several caves. Alighting from the jeep is allowed only at the biggest of these caves aptly titled “Badi Gufa” and at the Vishnu idol as the remaining caves are generally dwelling places of the tigers. Though a rough and steep road goes right up to the 10th century fort, visits to the fort have been stopped for several years now. The fort complex has a temple with a priest in place, though it is difficult to imagine how he lives there alone in the wilderness as the fort area is known to be frequented by tigers. Once a year, on the day of Janmashtami – the birthday of Lord Krishna – people from the nearby villages are allowed to trek up to the temple and the tigers must be keeping away due to the presence of so many people. 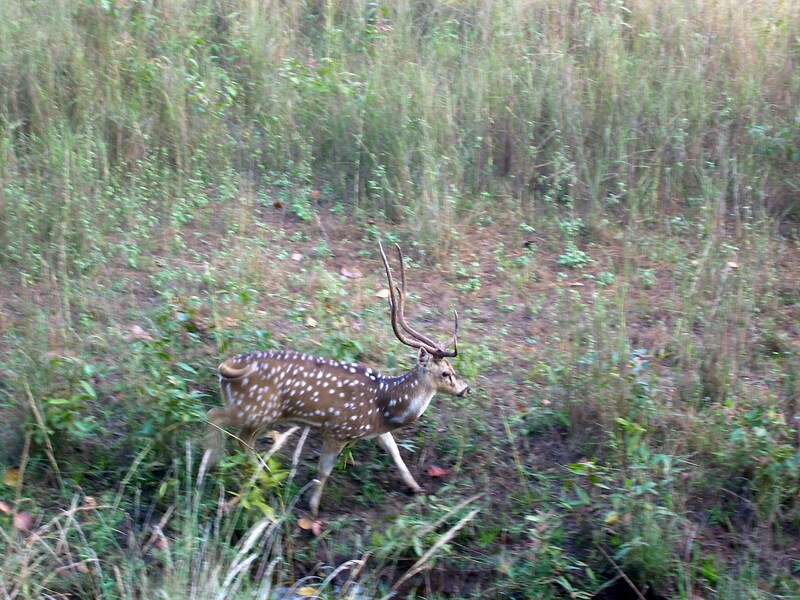 In the Tala zone of the forest, we could see plenty of spotted deer, sambhar, peacocks and langurs. The throbbing wildlife was all around. Twice we heard the alarm call of langurs, which unfailingly gives away the presence of the tiger, and waited for a while but we could not see the tiger. The ride through the forest was mesmerizing nevertheless. Coming back to the tiger we saw, the thrill of seeing a tiger in the wild is unimaginable. Though our hands were shaking, with excitement and fear in equal measure, we were able to take photographs and it ended all too soon. Since we were on the last leg of the morning ride and moving towards the exit, we were busy recalling the tiger sighting we had, how magnificent she looked as she strode across the track when, all of a sudden, as we turned a bend in the road, we saw a tiger straight ahead and walking towards us. There were a couple of vehicles behind the tiger and she (it was the mother we were told) must have emerged from the forest in front of them and walking away from them when we came bang in front of her. It was a heart stopping moment. There were frantic signals from those in the other jeeps asking us to back and allow the tiger to continue on its path. The driver of our jeep did comply but in the confusion and the hurry, he hit a rock and could not back any further. I have never seen a tiger head on (we could see only the head and front legs – it was walking in perfect alignment) and the experience was bewitching to say the least. She kept coming for a few more steps and then coolly changed course, and sauntered across to the other side of the road and into the forest cover. Needless to say, none of us took any photographs of the front view and were galvanized into action only when she was about to enter the forest cover. No regrets whatsoever. What is a photograph, when we could experience those moments that had us spellbound! The forest department’s complex at Tala has several Forest Rest Houses and a very informative and well designed museum. There is also an open amphitheatre and wildlife films are screened for the visitors. The film on “Charger” a very famous and aggressive male tiger who reigned over the Bandhavgarh forest for a long spell and “Sita” the tigress who was his mate and had produced several off springs, is worth watching. Booking of the Forest Rest House is a bit of a pain (when will they make it simple and transparent?) and one can try several lodgings and resorts in Tala village right outside the Park gates. The best time to visit the Park is March – April as tiger sighting is almost certain. This is in response to the Daily Post photo challenge on Adventure. Trekking in the Himalayas is a complete adventure. 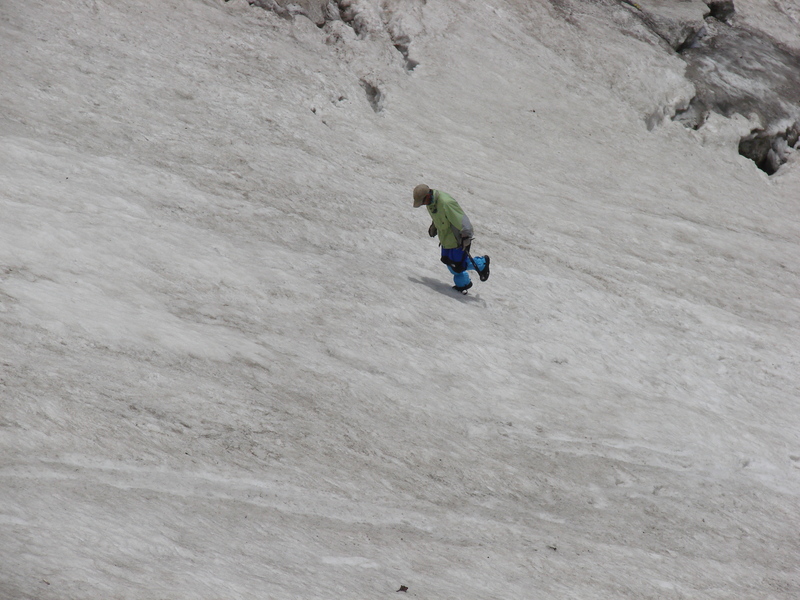 But for me, the adrenalin rush is pronounced when I have to cross a glacier. When a trek route is being discussed and finalized, the first thing that I ask is “how much of snow will be there?” I am not bothered much about the altitude, having gone up to 19000 feet while going around Mount Kailash in Tibet. Snow conditions depend not just on altitude alone but also on the geographical location and the month of the year. But walking on ice is not a cakewalk (pun intended) for me. The following 3 photographs were taken on my trek to Har ki dun, a beautiful valley at the base of swargarohini peak in Uttarakhand region of the Himalayas. 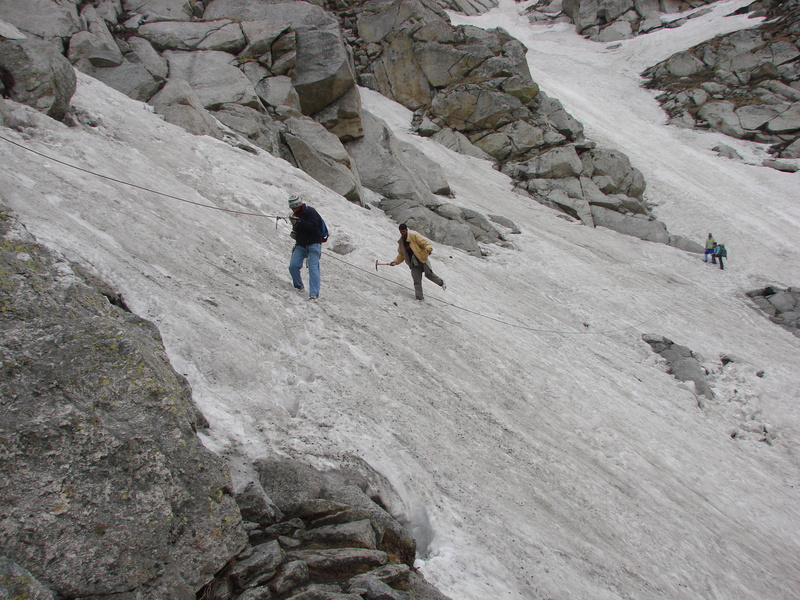 We had taken a circuitous route which entailed crossing a series of glaciers on one day, most of them being on an incline of about 60-70 degrees requiring fixing of rope. A few years later, on a trek to Indrahara Pass in the Dhauladhar range of the Himalayas, I opted to stay back at the last camp at the foot of the pass and 5 members of the group left at four in the morning to negotiate the steep (read scary) snow track , full of crevasses. 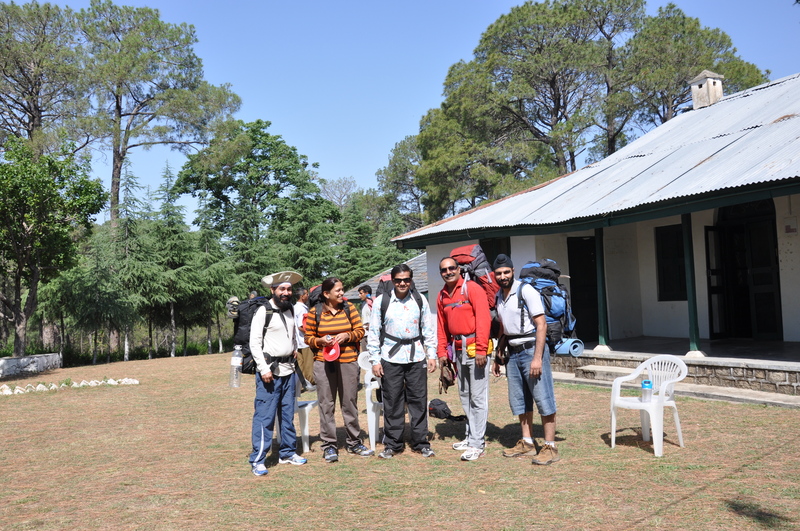 You can see my good friends Arvind, Jaspal and the guides in the following photographs. Hair-raising adventure indeed! In my day-dreams, I envision a place. A cottage in the countryside, compact, having a garden and a sit-out. Often, I imagine living in a place like this, peaceful and contented, tending to my garden, eating organically grown food and taking long walks in the countryside, with lush fields on either side. Of course, it should not be too remote and have a fairly good connectivity to nearby towns and cities, which one can visit occasionally. Does it paint a wonderful picture? Perhaps, this is a vision which is not uncommon among the urban dwellers, especially those who are past their prime. Serenity in a great setting? I would like to have that, please. When I was younger, I would often imagine buying a small house in the countryside after I have earned and saved enough to quit my job. This was to be done some day but, in the meanwhile, I kept visiting the countryside, sometimes as a day-trip from the nearest town where I could stay, sometimes as a part of hiking in the mountain trails, a few times when I could find a home-stay in a village or farm. These have given me the opportunity to live for a day or two in the countryside and walk a good deal. Over the years, I find that this is better than buying a house with all the attendant problems of ownership, local politics and being tied down to one place. Also, serenity is a state of mind, is it not so? And I should attempt to move in that direction, in the here and now, wherever I am living. So, my new mantra is “earn well, save well and travel well”, with more journeys into the wilderness rather than to big cities of the world. During my ramblings in the countryside, when I come across a quaint cottage with a garden, I re-visit the day-dream with a slight twinge of regret. And then, I tell myself that being there and experiencing the beauty is more important and has greater value. 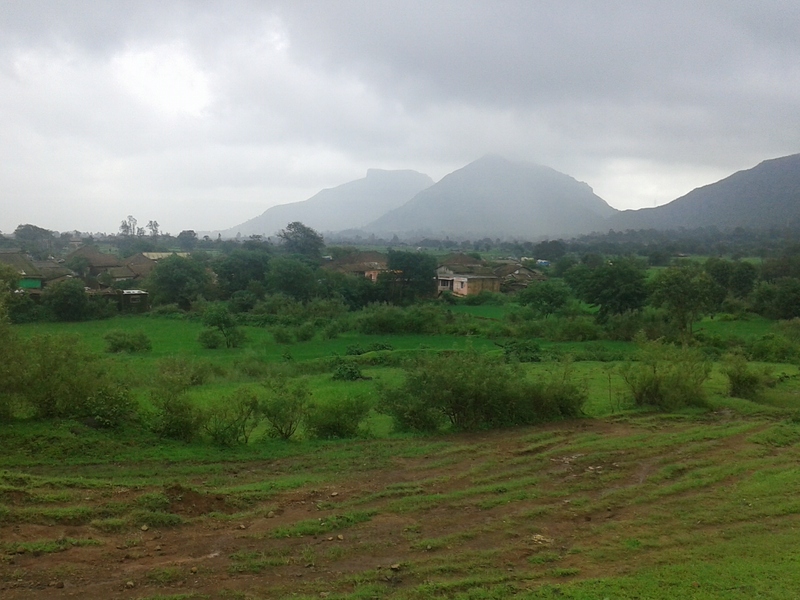 My recent visit to a place called Igatpuri (a small town in Maharashtra, India) and the walks I had in the countryside around this place were sheer joy. As I crossed the ridge, quite out of breath after the three and a half hour’s stiff climb, my eyes fell on kareri lake, with the Dhauladhars rising majestically from its banks. 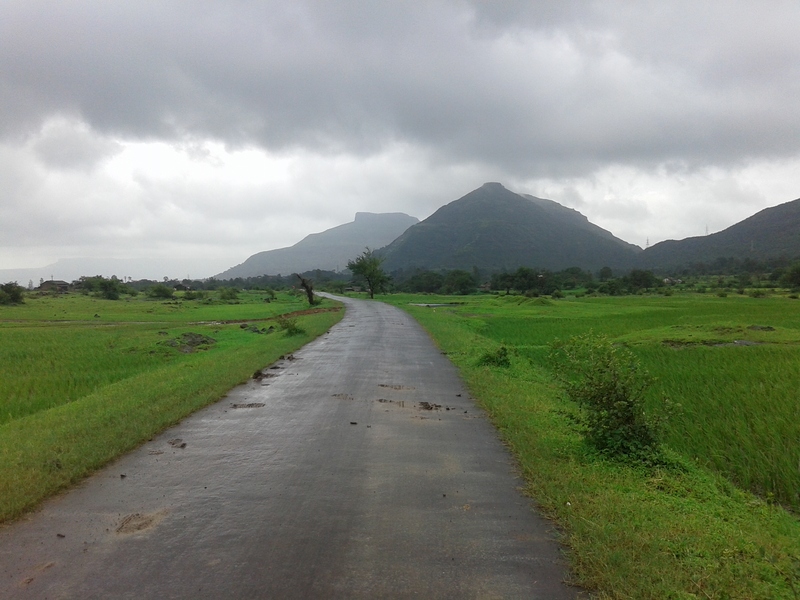 It was like a jewel shimmering in the midst of that vast landscape! 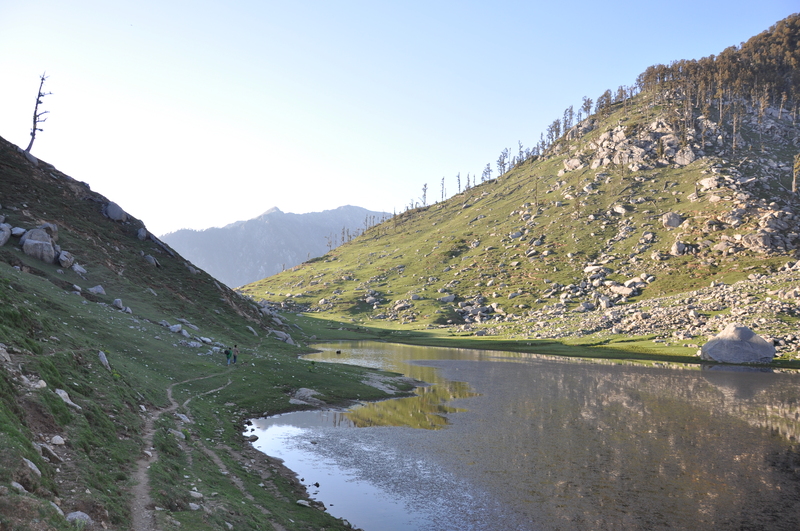 Kareri dal is a natural lake at an altitude of about 11000 feet, fed by the glaciers of Minkiani Pass in the Dhauladhar range of Upper Himalayas. We had trekked for 3 days to reach this piece of heaven on earth. 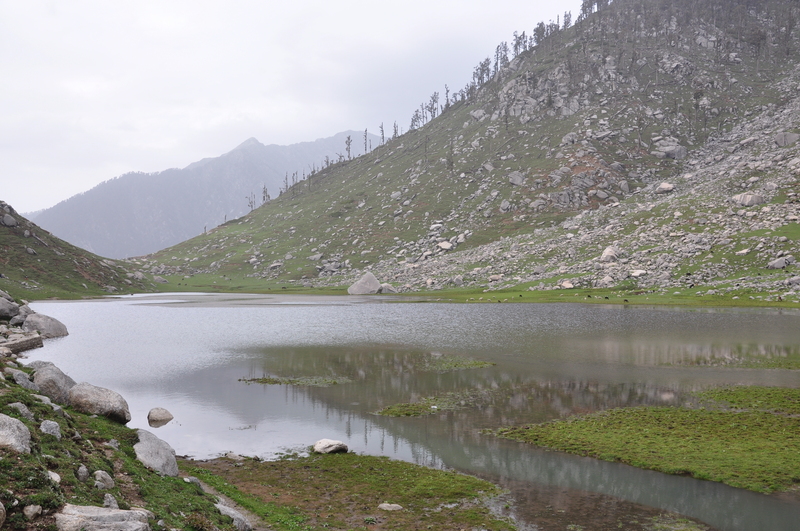 The lake can be reached directly from Kareri village, involving a trek of 13kms, but we had taken a circuitous route and returned to the road head through Kareri village. Every summer, as the temperatures soar in the Indian plains, the higher regions of the Himalayas beckon the avid trekker. And forgetting all the travails, the weary feet, and the leaking tents of the earlier treks and buoyed by the selective memories of the time spent in the lap of nature, the trekker starts collecting the gear for yet another hike in the Himalayas. Believe me, the pull is very strong. There are two ways to do this trek. You have to reach Dharamsala in either case and from where arrangements have to be made for porters, guides and provisions. 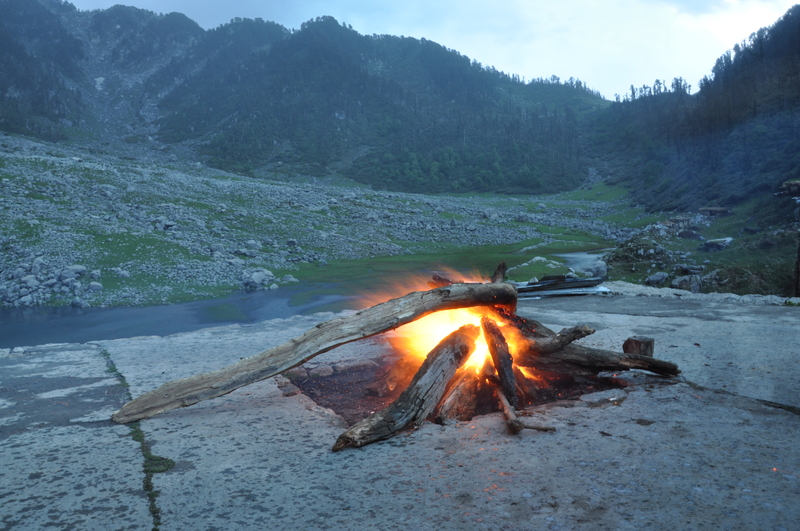 The route commonly taken is Dharamsala – Gera(roadhead) – kareri village – kareri lake – Minkiani top – Kareri lake and return the same way. 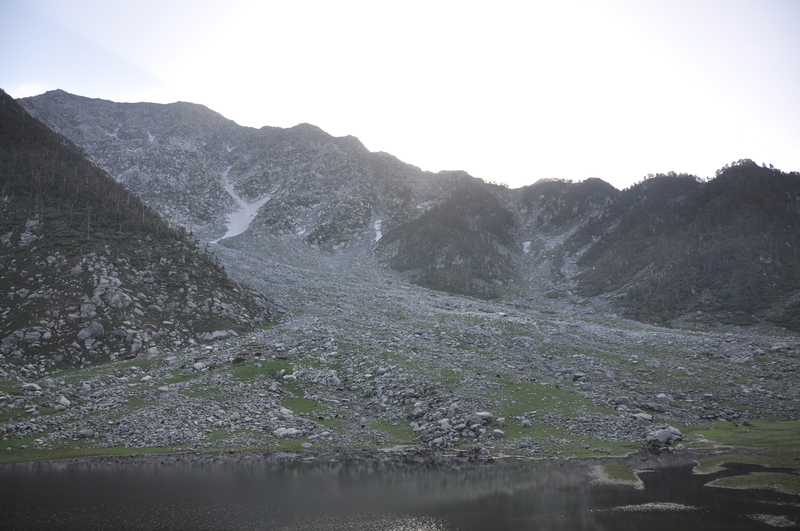 The other route (which was what we took) is Dharamsala – Salli(roadhead)-Chandrela Mata Mandir – Daler – Kareri lake – Minkiani top and the return is through kareri village and Gera. The first night, after engaging the cook and porters and making other arrangements at Dharamsala, we halted at Drini Forest Rest House, an hour’s drive away. The Rest House was well maintained and we spent an enjoyable evening and the next morning there on the lawns. Day 2:- Our rucksacks packed, we left Drini after breakfast for Salli village, 8kms away, on a hired jeep, and started the first day’s trek of 6-7 kms to Chandrela Mata Mandir(temple). The terrain was initially barren and with the sun blazing, the uphill walk was quite tedious till we reached a stream and had our first break. With our shoes off, sitting on the rocks with feet in icy water and sipping fruit juice and munching biscuits, we got into the groove of Himalayan trekking. 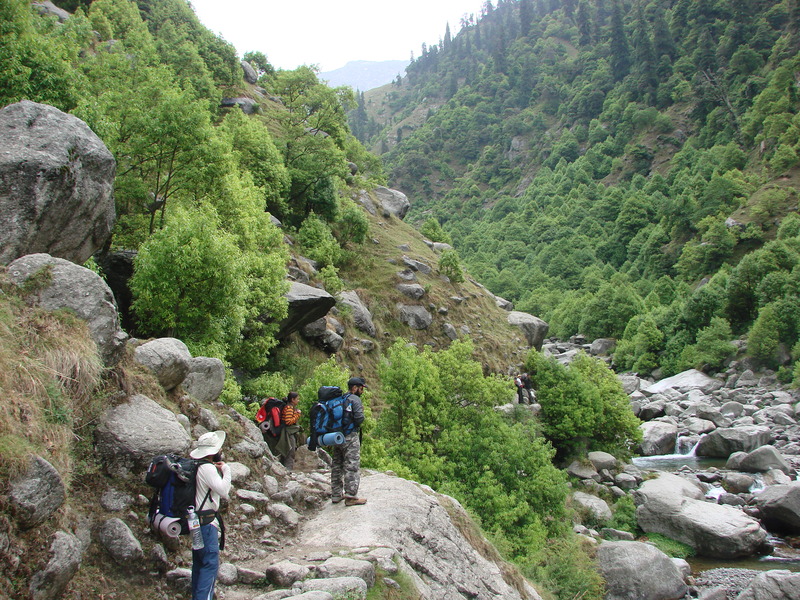 The rest of the trek was along the stream as the path ascended gradually and there was more vegetation. This is a well trodden path with villagers going to the temple, women returning from the forests with sacks of lungdu, a variety of leafy greens, which is a speciality in this region. We were to taste this eventually when we had lunch at the home of our cook in Kareri, our last camp. 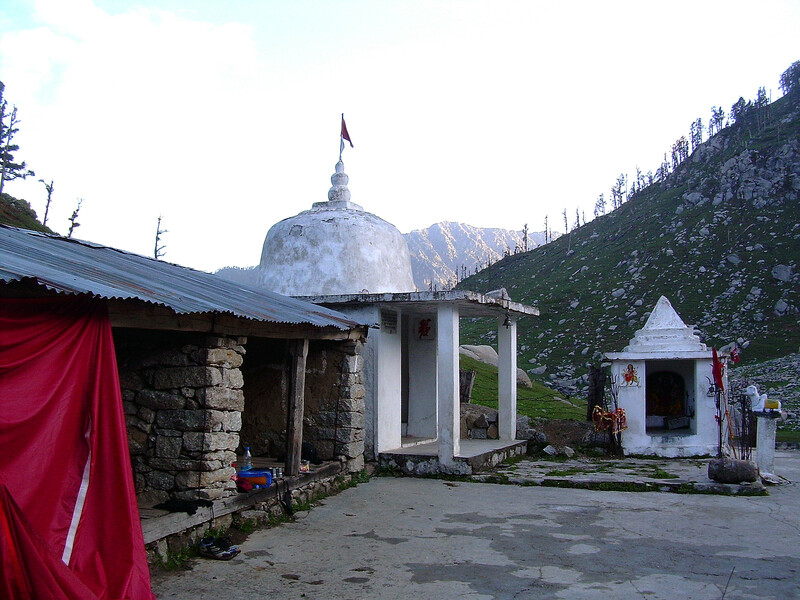 We reached Chandrela temple at around 2 in the afternoon. After stopping briefly at the temple of the Goddess, which was manned(?) by kids who blew the conch and put a dash of vermillion on our foreheads, we pitched our tents on the grassland adjacent to the temple. An unused shepherd hut was to be our kitchen, and the same pattern followed at the higher camps too. A huge flat-topped rock served as our sit-out, chatting room, dining table and lying on it after dinner, facing the star-studded sky and identifying the constellations, it somehow seemed to be worth all the trouble taken to reach here. Day 3:- There were dark clouds in the horizon as we left the campsite after a breakfast of parathas and pickle with tea. The day’s trek was along the stream as the boulder-strewn path ascended gradually. There was very little vegetation and but for the interest generated by the hydro power project that is coming up in this area, with the tunnel for the water course nearing completion, there was nothing much to recommend for the day’s route. A little drama while crossing the stream, which required jumping from boulder to boulder, with two participants slipping and getting wet, and we were through with the day’s trek as we clambered up, passed the shepherds’ huts and reached our campsite at Daler, at the base of Baliyani Pass. And what a campsite it was! 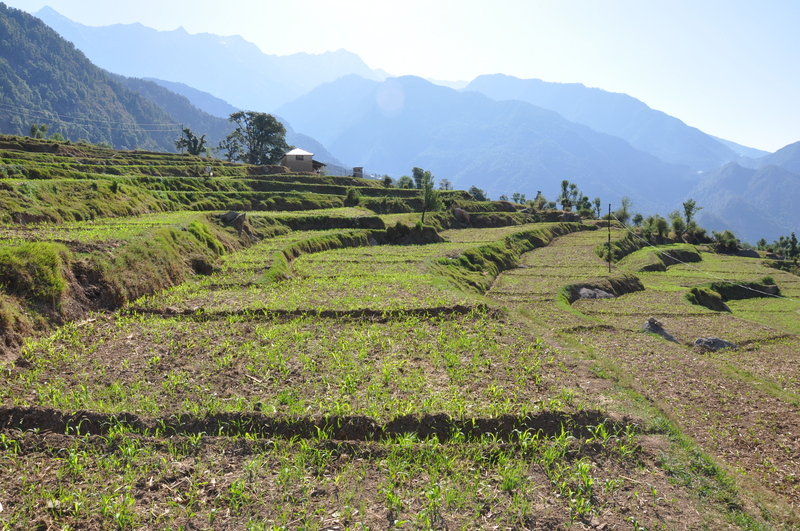 It was a flat meadow with fresh grass that had come up after the snow had melted and the lower ridges of Dhauladhar loomed all around. The top- most ridge to the right was our next destination as Kareri lake was beyond this ridge. 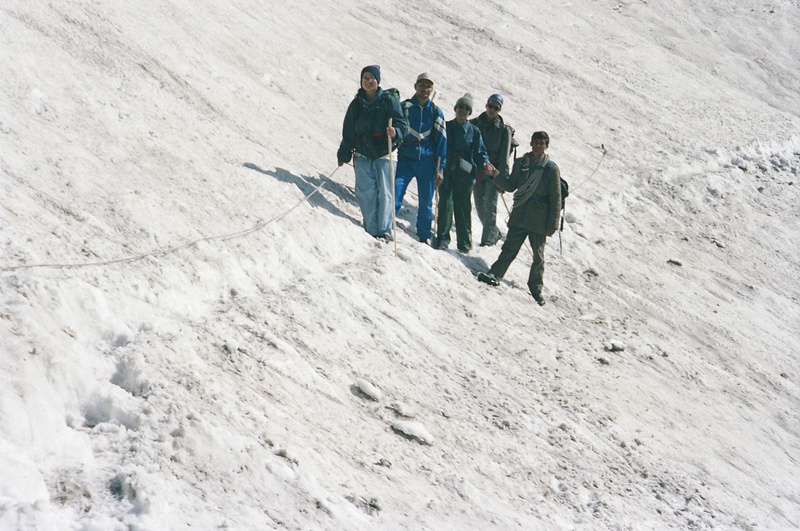 Every time we looked up in that direction, a little apprehension crept in, despite years of walking in the Himalayas, as the trail seemed very steep and quite difficult to negotiate. This place got the name Daler as the excess water from the kareri Dal(meaning lake) used to overflow from over the ridge to this area. Now, the excess water from the lake has been channelled to flow down on the other side to kareri village through the kareri nallah. We spent a wonderful and sunny evening at this camp, interacting with the gaddis (the shepherds who take their flock of sheep every year for grazing in the high grasslands which come up after the snow melts) and were treated to tea and fresh khoya ( thickened milk) by a warm-hearted gaddi woman. Day 4:- It was not a clear day and dark ominous clouds were gathering all around. We debated on whether it would be better to leave early and go through the stiff climb before a heavy downpour or wait till it rains and the weather clears up. We finally took our guide’s advice and set off soon after breakfast. This trail was not only steep but also risky at certain patches, which had to be negotiated carefully, consciously keeping to the mountainside, as an accidental slip could mean a fall down the steep gorge to the right. To add to the woes, it started raining and climbing became more difficult with the rain sheets. A first time trekker of the group used all fours to negotiate the risky stretches and this was promptly categorised as “octopus-style climbing”. It was a very sensible thing to do, under the circumstances. No looking around, no photography – we concentrated only on where our next step was going to be. After an hour and a half of this kind of scary climbing (thrilling in retrospect), we took a break as we had covered half the distance and had crossed the “danger area” as our guide put it. It was still drizzling and we huddled within our rain sheets, and de-stressed by munching biscuits and wafers. We covered the rest of the trail in an hour and crossing the ridge, came upon huge grasslands and then the lake. As I said earlier, it was indeed like a shining jewel in the midst of that vast landscape. There is a temple on the banks of the lake, with a few make-shift log huts (with no doors – just stacked logs and a tin roof) but having a large cemented terrace overlooking the lake and facing the Dhauladhars. We set camps in these huts and had all our meals on the open terrace, around the fire on which the food was being cooked. 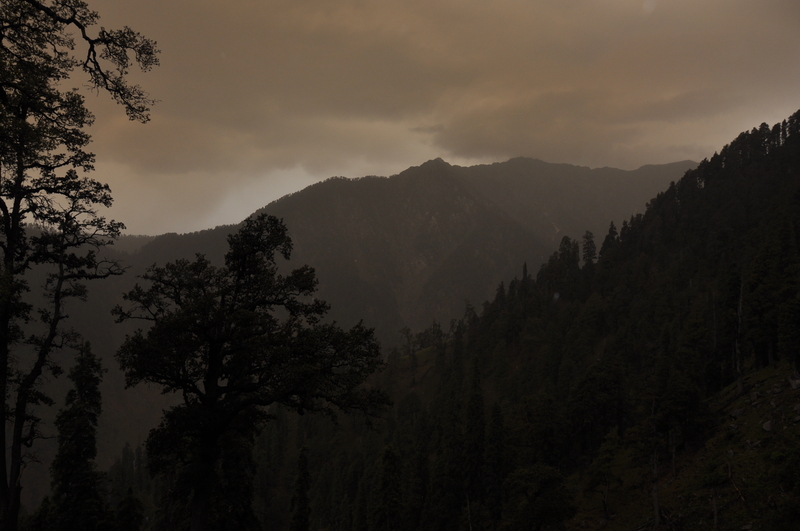 Soon after we had reached Kareri lake, the weather changed again dramatically with hail storm and heavy rain, which is typical of Dhauladhar ranges. Day 5:- We did not have to move camp this day and everyone was relaxed. We had no specific plans for the day – just walking around the lake, through various trails leading to shepherds’ huts, up the trail leading to Minkiani Pass and as far up the glacier as we could climb without difficulty, on to an adjacent meadow for a game of cricket, lazing under the sun on the terrace with a book and of course, waiting for the next meal. It was such a wonderful day, spent in the lap of nature, with good food and friends around, far from the worries and stresses of urban life. Day 6:- We left Kareri lake after breakfast and started the downhill trek of 13 kilometres to Kareri village. 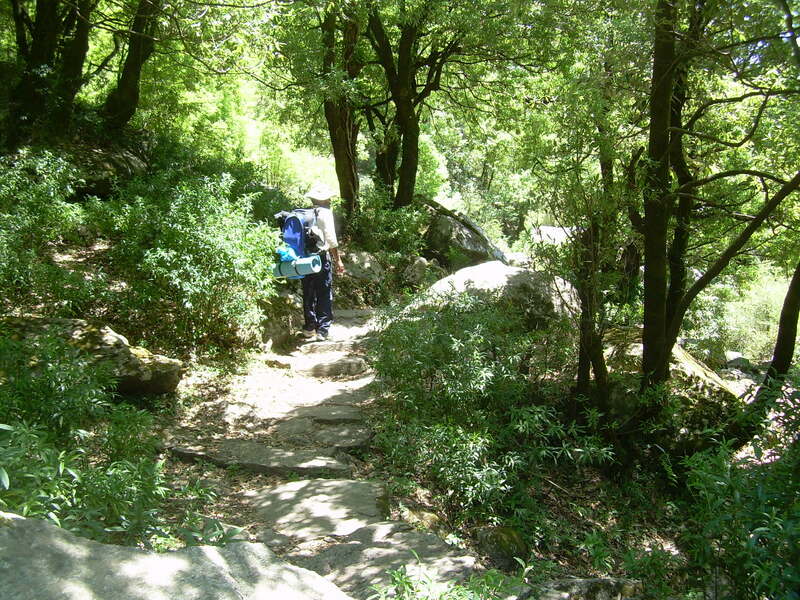 It is a beautiful trail passing through forests, with the gurgling stream never far away, and but for the length of the trail and several steep stretches (which take a toll on the knees and toes) it can be rated as one of the most delightful hiking trails of the Himalayas. We reached Kareri village at around 2 in the afternoon and stayed at the old and poorly maintained Forest Rest House, built during the British time. The cook belongs to this village and he invited us for lunch at his home. We had no energy to explore the village that day. Day 7:-In the morning, feeling fresh and energetic again, we walked through the village, its alleys and terraced fields and were invited by many to enter their homes and have tea. It was a pity we could not say yes to all of them. The village has a primary and middle school, and almost all the children continue their schooling in the High School at Gera, involving a 12 km walk every day. After breakfast, we too walked the 6 kms to Gera and then onward to Dharamsala. This was a nice, circular hiking trail, which took us from 5000 feet to a height of 11000 feet, through green meadows and forests, glaciers, lake, shepherd huts and a vibrant village with hospitable folks.